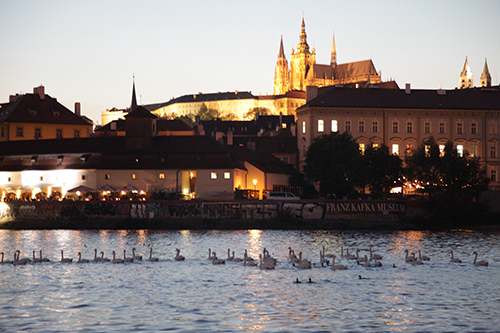 Ever since our first visit to the exquisite city of Prague, we dreamed of sharing the incredible experiences we enjoyed there with our musical communities in New York and San Francisco. And so it was with enormous satisfaction and pride that we eventually realized that dream, appropriately soon after the conclusion of Music@Menlo’s Around Dvořák season. 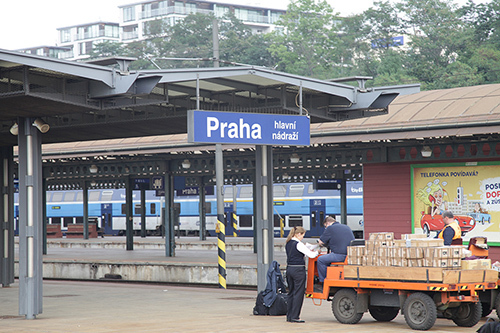 After duo recitals both in the north and south of Germany, we boarded a train in Munich that took us, in a state of great excitement and anticipation, directly to the main station of Prague. 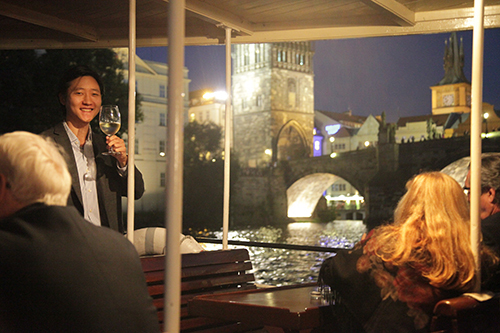 A total of twenty-five travelers joined us for the visit, meeting up with us at the stunning Aria Hotel in the quieter section of the city, the Mala Strana. There, we were greeted by our tour manager Peter Straus of The Grand Tour, and by Ivana Tatkova, our local guide. 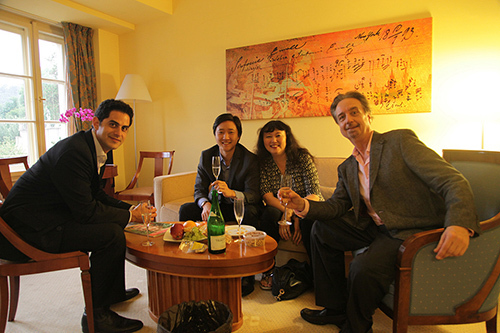 In short order, we called for the first musicians’ “faculty meeting” in our room, where we were delighted to greet our two extraordinary colleagues for the tour, violinists Sean Lee and Arnaud Sussmann, who gallantly doubled on viola, as needed. 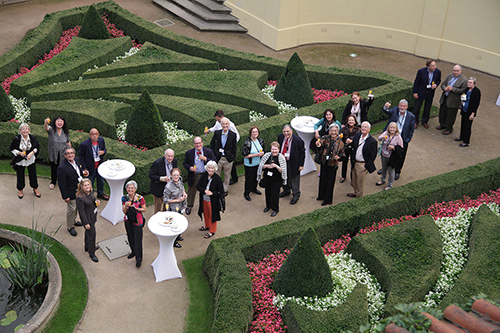 A lovely reception in the hotel’s private garden allowed us not only to greet our group on the ground, but to snap a bird’s eye view photo of them from our room, the Dvořák Suite. We were fortunate to have with us as well our two Development Directors: Annie Rohan from Music@Menlo and Sharon Griffin from the Chamber Music Society, who worked tirelessly to ensure that all our travelers’ needs were met. 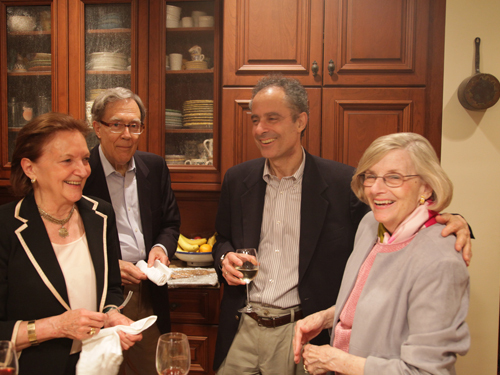 Wu Han and I welcomed the group over champagne and hors d’oeuvres. We then headed out towards the nearby Charles Bridge, the most iconic of Prague’s river crossings, built in 1357 by King Charles IV. 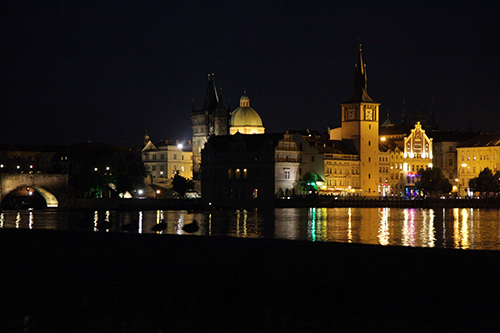 Our destination, however, was the Kampa Park restaurant, situated directly on the Moldau, where we enjoyed a festive meal and a perfect view of the bridge. 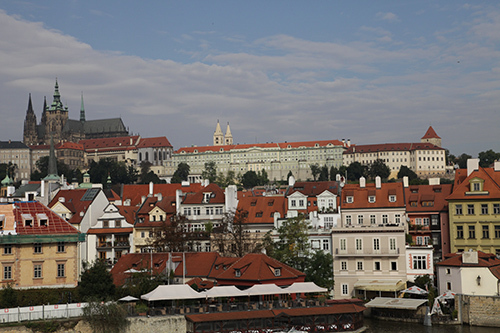 The next morning we set out on the dot of 9:30 am for a place Wu Han and I had heard much about but never seen: the Strahov Monastery, which overlooks Prague from up the hill behind our hotel. 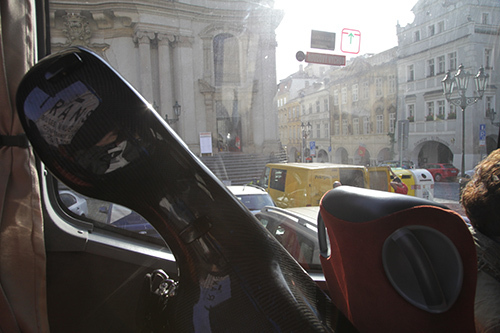 For this, and many other outings, we boarded a cozy bus that seemed designed to perfectly fit our group – including my cello, which always gets its own seat on planes, trains and automobiles. 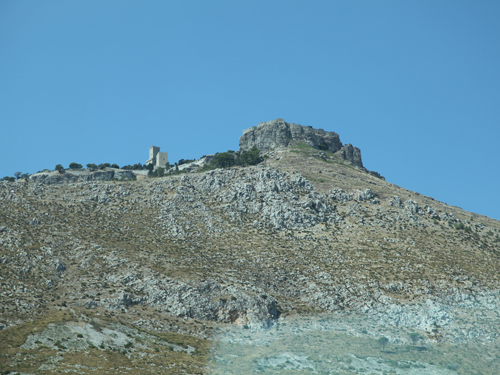 The monastery was founded in 1143 by a local bishop who was inspired by a trip to the Holy Lands. 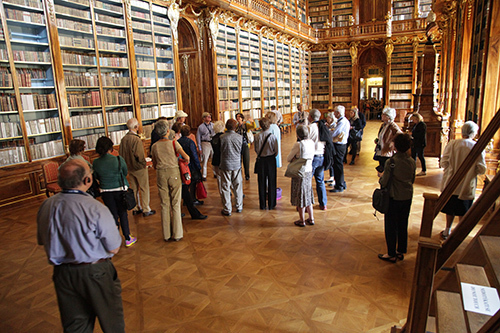 The main focus of our visit was the library or Theological Hall, which dates from 1679 and is truly a wondrous sight to behold. Our visit there was made all the more special as we had gained exclusive access to the library (with countless other tourists staring jealously at us through the door). 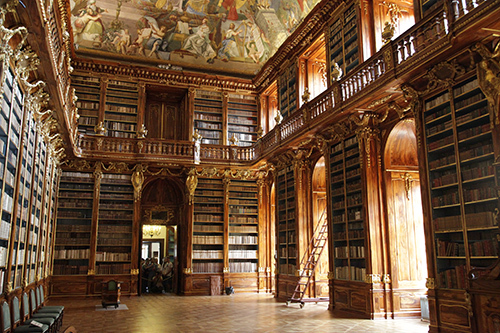 It was in the library that we first got a taste of Ivana’s vast knowledge of Prague’s history. This remarkable, charming and articulate woman spent virtually the entire tour with us, and I never heard her asked a question that she couldn’t answer. 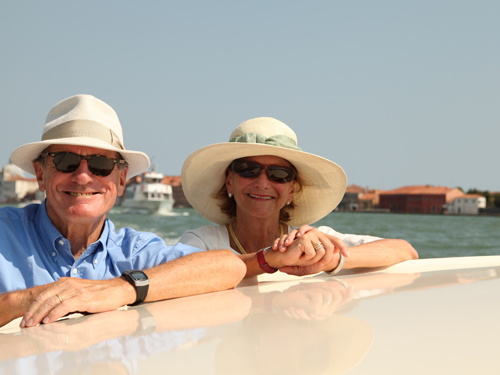 People like Ivana would make me consider becoming a tour guide in a next life – such is the admiration I have for them. The library fortunately survived conflict through the centuries, as well as its secularization during the Communist regime. 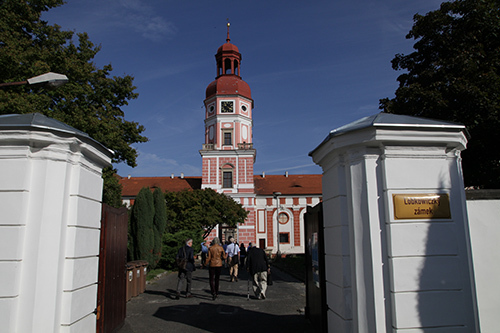 On the occasion of the Velvet Revolution in 1989, the monastery was returned to the religious order from which it was confiscated, and subsequent care and renovation restored it to its former glory. There is literally not a place the eye travels that it does not encounter extraordinary beauty. 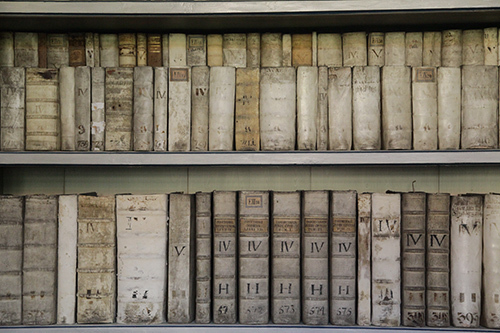 I especially loved looking at – and photographing – the thousands of ancient books, many bound in white leather. 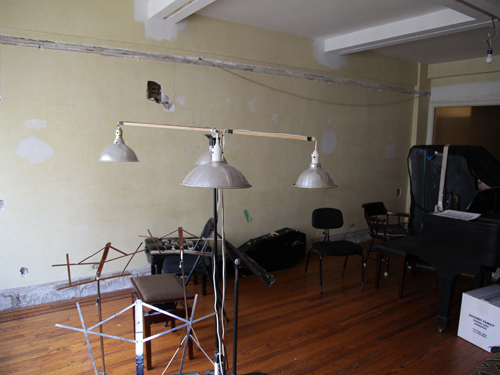 After recovering from the breath-taking sights in the library, the group walked past the church, through a courtyard, and upstairs to a small but perfectly formed chamber music room, the site of our first concert. 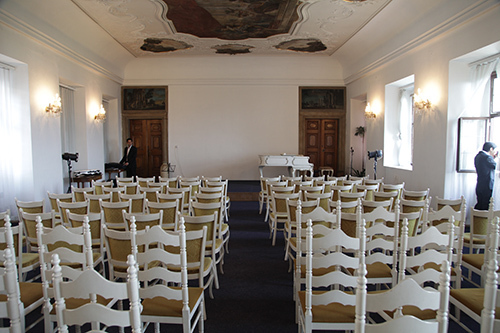 A close inspection of the photo above will reveal a white piano facing backwards, away from the audience. None of us could figure out for what purpose it had been positioned that way, but the musicians and I (plus Peter Straus) managed to lift it and turn it around. One never knows what roles one must play during a musical career! 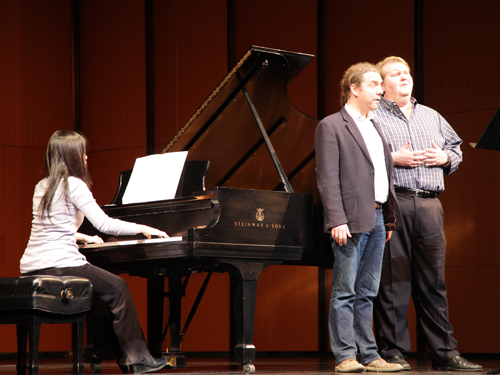 Our performance began with Arnaud and Wu Han reprising Dvořák’s Sonatina, Op. 100, a charming work that he composed during his stay in America. 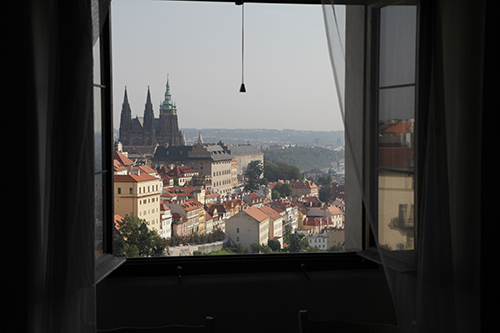 As I enjoyed the incredible view of the city from the window while listening to such gorgeous music, I must admit that pretty intense emotions suddenly caught up with me, and I doubt I was alone. Hearing great music is always an emotional experience, yet this moment was, for me and Wu Han, the culmination of years of dreaming and planning, and here it was in real time. There are really no words to describe the beauty of that moment, one that will stay with me, vividly, forever. Hearing just the first few exuberant bars of this piece, in the heart of the Bohemia so dear to Dvořák, was worth the entire trip right there. The acoustics of the room were wonderful, and the piano – a Petrof, the Czech Steinway as they are called – was well tuned, thanks to Peter’s diligent and insistent preparatory work. Following the Sonatina, Arnaud took out his viola and was joined by me, Sean and Wu Han for Mozart’s E-flat Piano Quartet. The privilege of playing Mozart in Prague – a city he loved so well and which loved him back equally – was also a great thrill and a fitting component of our musical pilgrimage. Our fun-loving audience was delighted by the sight of Arnaud and Sean, both wearing black suits, posing as Wu Han’s bodyguards, and a large, spontaneous photo session ensued. We departed the pretty room slowly and somewhat reluctantly, as we had all shared a very special hour in it. And if you are wondering: yes, we left the piano in a position suitable for the next group of deserving musicians. 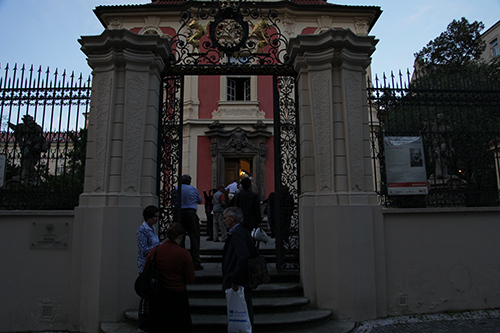 After walking single-file through a tunnel under the neighboring building, we emerged onto the street outside the monastery for the short walk to the Prague Loreto. 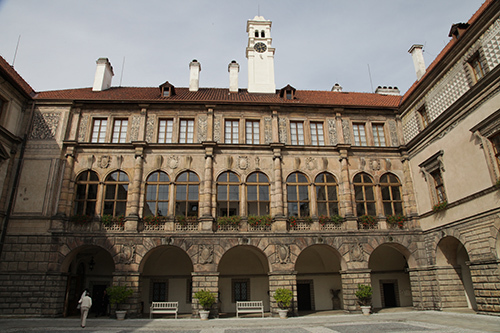 The Prague Loreto is an ancient cloister, an intimate collection of buildings of extreme beauty sheltered from the city by high walls. 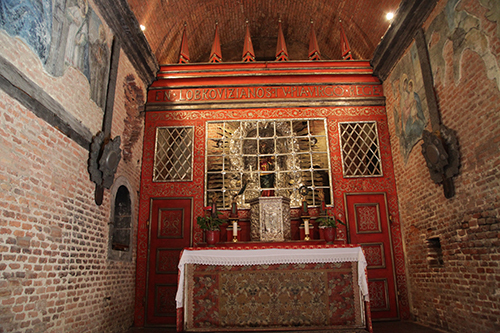 Begun in 1626 as a result of the efforts of a member of the Lobkowicz family, the complex grew over several centuries and became a famous destination for pilgrimages. 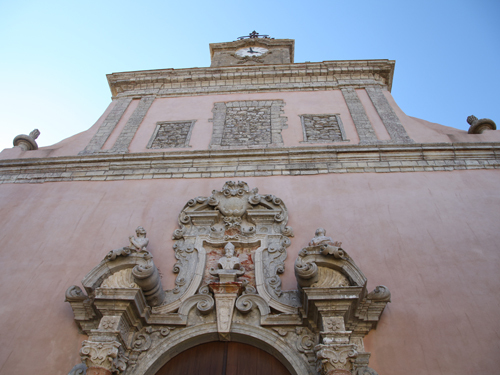 The central courtyard is ringed by an arcade decorated with mesmerizing paintings, many faded over time, which encloses the church and Santa Casa, the ornate building to the right which is the heart and original building of the Loreto. 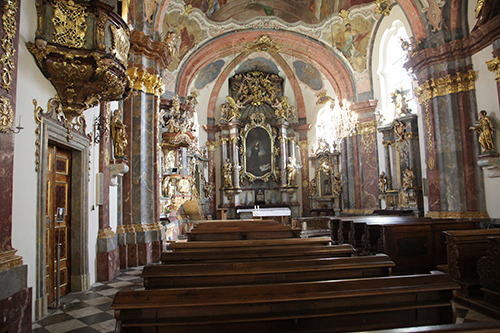 The interior is richly decorated and bears the Lobkowicz name prominently. 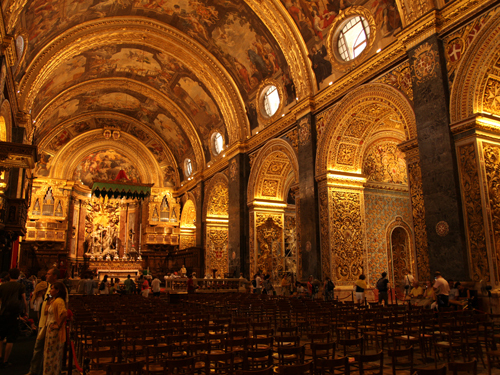 The much-larger Church of the Nativity of our Lord is visible behind the Casa, and its interior is also lavishly decorated with silver, gold, sublime paintings and a huge variety of colored marble. 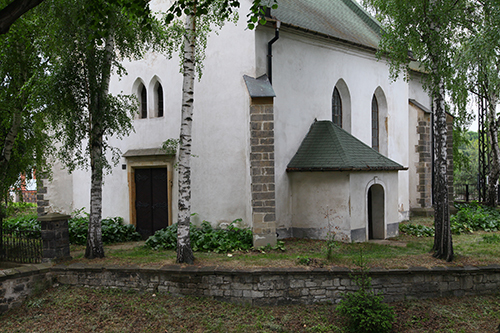 The church was consecrated roughly a century after the founding of the cloister. After another picturesque stroll through winding cobblestone streets, we arrived at the Golden Pear for a delicious lunch. It was hard to believe we had done so much already, and it was barely 1 pm! 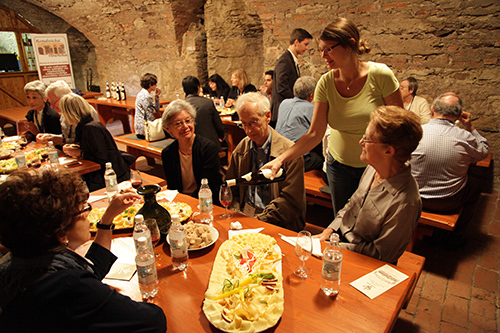 At meals such as these, the opportunities for socializing and meeting some fellow travelers for the first time became quickly apparent. On this particular trip, literally everyone had come to experience exactly the same things, so we all had a lot in common. 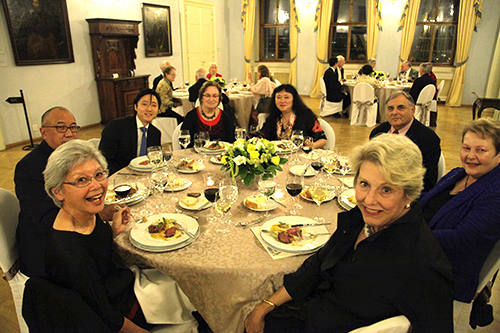 And, what a thrill it was for me and Wu Han to see such dear friends from both coasts come to know each other and form lasting relationships – another wonderful dream that came true in Prague during these amazing days. Free time in the afternoon freshened us all up for our visit to Prague’s famous Rudolfinum to hear a concert by the Tchaikovsky Symphony Orchestra (from Russia) as part of the annual Dvořák Festival. 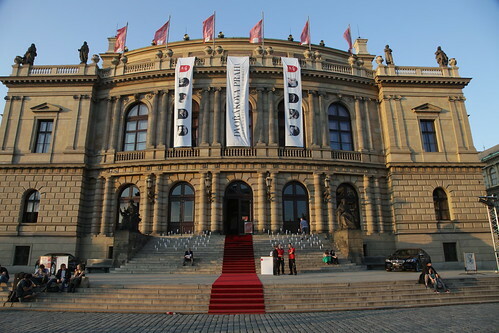 The Rudolfinum is named for Rudolf, Crown Prince of Austria, who officiated at the hall’s opening in 1885. It is one of Europe’s oldest concert halls and is the home of the Czech Philharmonic, which gave its first concert there in 1896, conducted by none other than Antonin Dvořák . The hall has fantastic acoustics, which I can attest to from experience both as a listener and performer, as well as genuine old-world charm and dignity, two qualities increasingly hard to come by today. Our group was divided in its assessment of the Prokofiev Violin Concerto which opened the program, but not one of us failed to notice that the musicians assumed on an especially lively character in the second half as they played their hearts out in Dvořák’s “New World” Symphony. Every section of the orchestra, from the double basses on up, distinguished itself, and they were justly rewarded with a rapturous reception from what we imagined must be an opinionated audience. 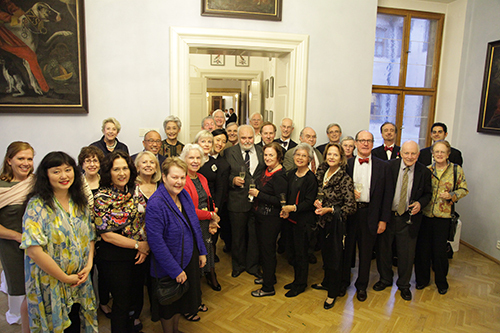 No doubt these Russians were thrilled – as any of us would have been – to perform this great work in Dvořák’s town. And, on top of it, here we were, a group of Americans, listening in Prague to this piece that Dvořák wrote in the U. S. and dedicated to our country, played with fervor by an orchestra of Russians. It was globalization at its very best. 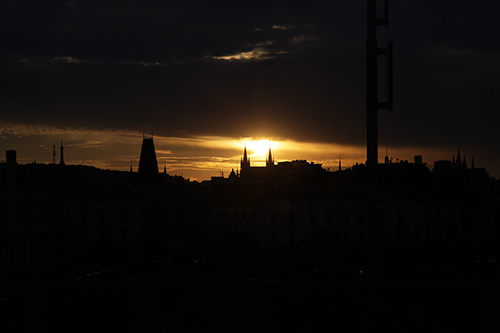 As if Tuesday had not been a big day already, our group was setting its sights even higher for Wednesday, and literally so, as we headed up and up first thing in the morning to the famous Prague Castle, which dominates the Prague skyline. 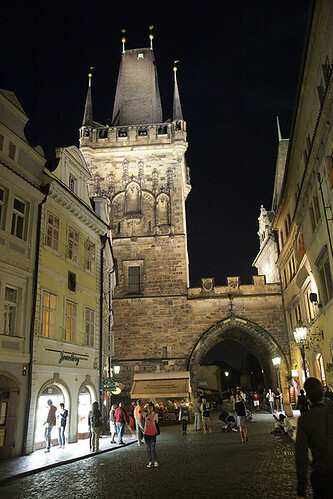 Seen in probably most images of Prague, the castle is as iconic and is recognizable on a level with other cities’ most famous landmark structures. It is the largest ancient castle in the world (according to the Guinness Book of World Records) and is residence of the president of the Czech Republic. Since it was built in the 9th century, it has been the seat of power for Holy Roman Emperors, kings of Bohemia, and modern leaders. The Prague Castle is actually a collection of distinguished buildings varying greatly in size, from the massive Cathedral of St. Vitus to various palaces, churches, museums, and smaller dwellings. 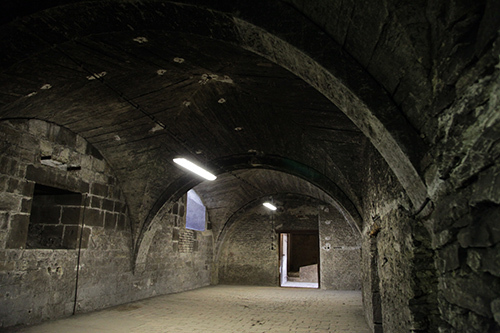 The castle contains buildings of virtually every architectural style of the last one thousand years. 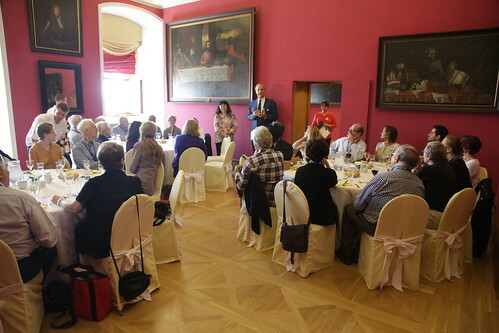 A whirlwind tour expertly guided by Ivana brought us all together at noon at one of the trip’s prime destinations and focal points: the Lobkowicz Palace, the Prague family seat of our friends William and Alexandra Lobkowicz and their three extraordinary children. 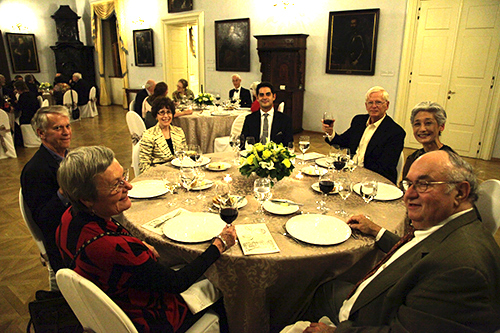 William Lobkowicz is technically the thirteenth Lobkowicz prince and the heir to all of the family’s holdings in the Czech Republic. A visit to the family’s web site (http://www.lobkowicz.cz/en/) will provide a detailed history of this noble Bohemian family, which dates back to the 14th century. 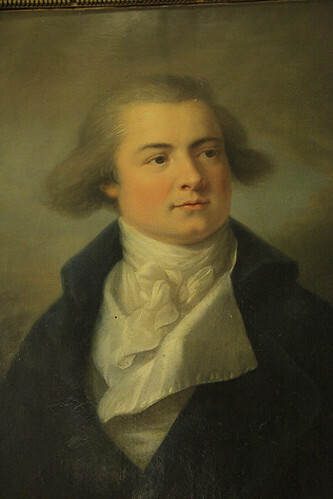 Our interaction with the Lobkowicz family, however, is centered around the seventh Prince, Joseph Franz Maximilian (1772-1816), who was one of history’s most passionate and dedicated music patrons. A serious amateur musician himself (there was little distinction in those days between amateur and professional) he also had exceedingly good taste, choosing to commission the likes of Haydn and Beethoven, among others, with spectacular results. The story of the Lobkowicz family has too many incredible chapters to relate here. The dramatic loss of their possessions twice, during and after the Second World War, and their recovery after the Velvet Revolution, is simply one of history’s most thrilling and remarkable stories. 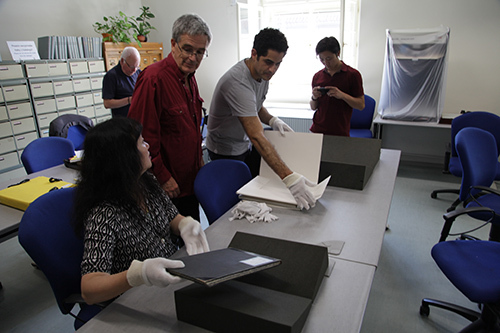 And making it all the more vivid is the personal relationship we now enjoy with present family, who are wholly responsible for saving and preserving one of the great historic collections of the world. 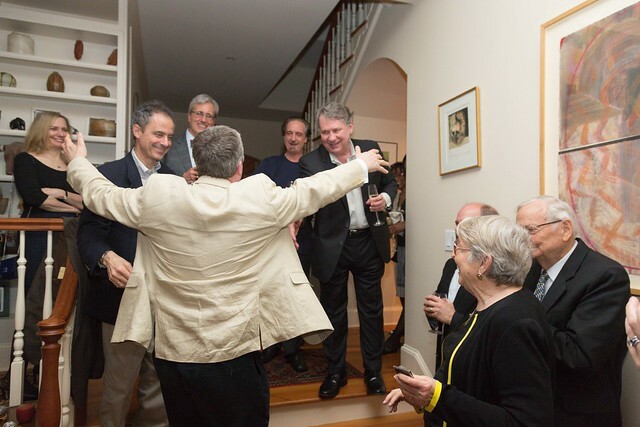 Our audiences in both New York and California have been treated to visits from the Lobkowicz family, who came to be honored, to share their incredible history past and present, and to hear us perform music by Beethoven and Haydn which would simply not exist without their ancestor’s vision and generosity. The family joined us in July, during their visit to Music@Menlo, for drinks on the porch of our Music@Menlo summer home. For our Music@Menlo audience especially, who had only last summer become accustomed to seeing William, in shorts and moccasins, playing Ping-Pong on the Menlo School lawn, it was quite a moment when he strode into the elegant dining room in the palace to welcome us to his, well, totally awesome home, the only privately-owned property within the Prague Castle. 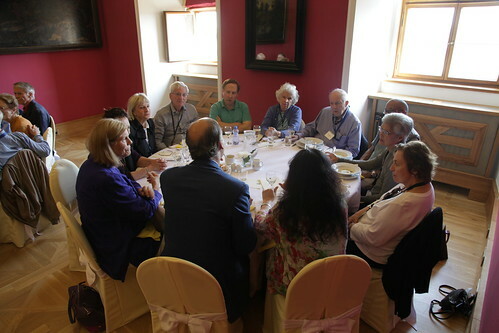 After giving us the briefest history of his family and the castle, William and Alexandra, who are always extremely busy taking care of business and visitors, graciously joined us for the entire lunch, answering the inevitably numerous questions that came their way. …was followed by a mind-blowing tour of the palace. 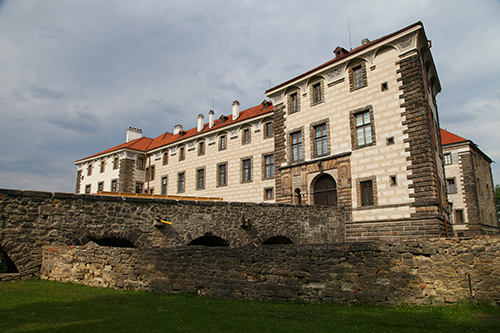 The Prague palace is one of the four castles that the family still owns and maintains, having sold or donated to the state eleven others that technically became theirs after the fall of the Communist regime. 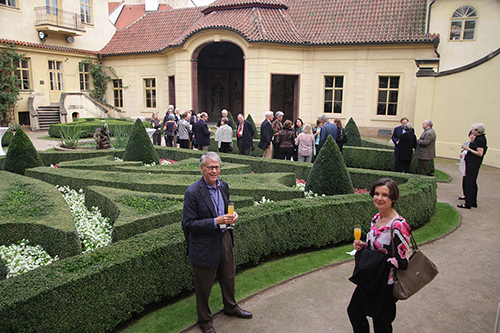 The family chose to use the Prague Castle – its most frequently-visited holding- to reveal both the incredible story of the family and to display some of the most prominent treasures of their collection. So while walking the many rooms containing paintings by artists such as Canaletto, Breughel and Velasquez, music manuscripts by Beethoven, family china services dating back centuries, arms, armor and tons more, one learns the story of the family, all eloquently narrated by William himself on the audio guide. 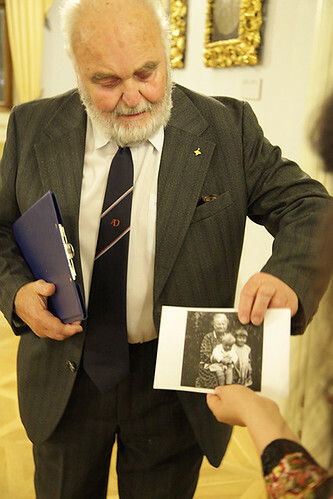 While it is indeed overwhelming to hear their story and look at their possessions, the unpretentious, humble and dedicated Lobkowicz family members of today truly make visitors feel welcome on a personal level. Their mission – to preserve and share the enormous slice of Czech history in their stewardship – is communicated clearly and with passion, and it actually makes you wonder if there’s some way you could help. 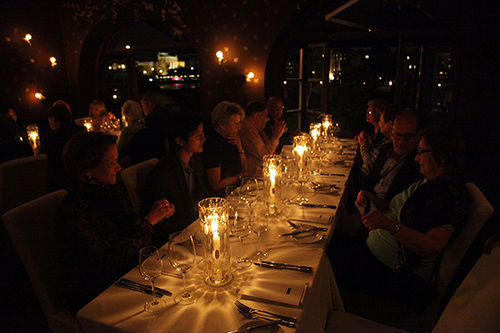 Dazzled by the incomparable experience of the day, we returned to rest for our Moldau dinner cruise. 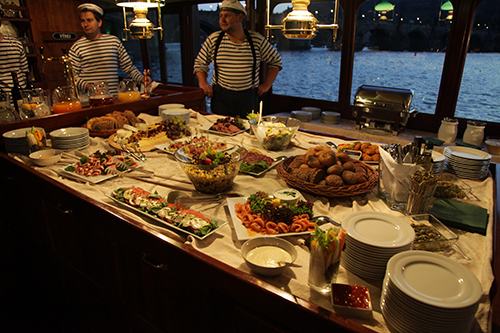 The quaint little boat, manned by a quintessential old-style ship captain and crew, sailed the river while we drank a lot of wine, tasted a huge selection of nibbles, and took many pictures of the incredible city views from mid-river, at sunset and into the night. To say that the 18th was the BIGGEST DAY of this tour is a statement that would cause no disagreement among our group. I’m talking about “big” in terms of not only the amount we all saw and did, but also recognizing the unbelievable stamina of the entire group, from patrons to musicians to organizers, which plowed through a wondrous wealth of experiences with a concentration and enthusiasm that was truly amazing. Leaving the hotel promptly at 9:00am, we enjoyed a picturesque coach trip into the countryside, arriving at another Lobkowicz castle, Roudnice, at about 10:30. Roudnice (pronounced ROAD-nitz-e to the best of my knowledge) was a large family seat of the family, and by large I mean that the property is bigger than the entire Prague Castle (not just the Lobkowicz palace). The castle is four centuries old and has 250 rooms (this is a good moment both to wonder how William and his wife manage to take care of such a place, let alone the others, and to better understand why William told us that “castles are great places to give away”). …literally dwarfed our group as we stood marveling at the size and scale of this house that was once the Princely and Ducal seat of the family. 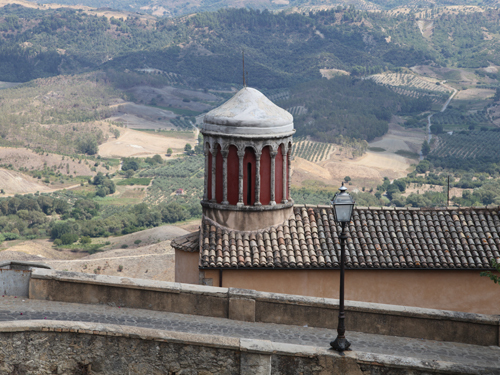 We had a good look at the beautifully restored chapel and a couple of other rooms, including a beautifully-perched balcony on the rear side which overlooks the little town. 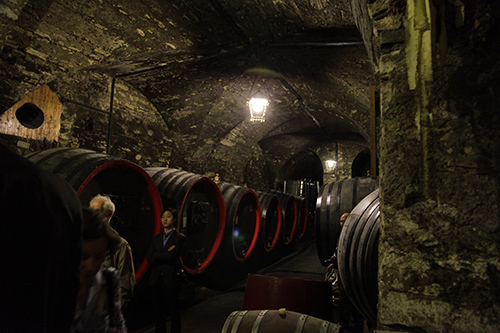 But a main focus of our visit was what happened underneath the massive castle: the production of the Roudnice Lobkowicz Winery. 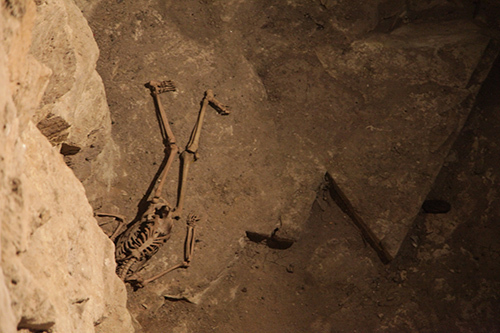 During the tour of the dungeon-like basement, we got a look at some of the ancient Romanesque foundations, as well as a view of the remains of a hapless one-time resident. 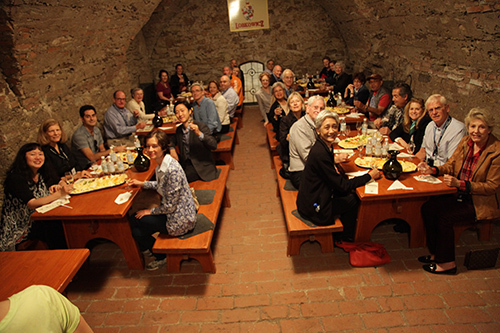 A brief walk around the castle walls led us to the Lobkowicz Winery tasting room, where lavish and voluminous cheese plates and way-too-much wine awaited us. 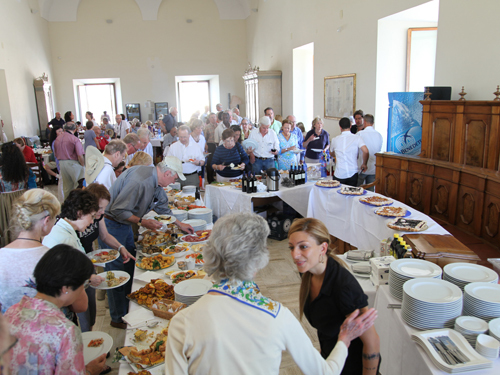 Lunch, by the way, was still to come. After about an hour of uninhibited eating and drinking, we boarded the bus in various states of consciousness, which unified themselves rather quickly into a solid group nap on the way to our next destination. 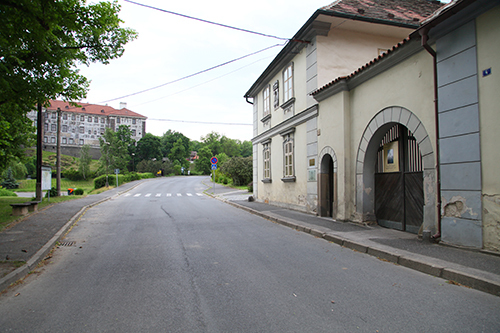 When we got to where we were going, what a wake-up call we had: the house where Dvořák was born. In this little town of Nelahozeves, about 20 minutes outside Prague, two of the principal arms of this tour linked together in the most extraordinary way. 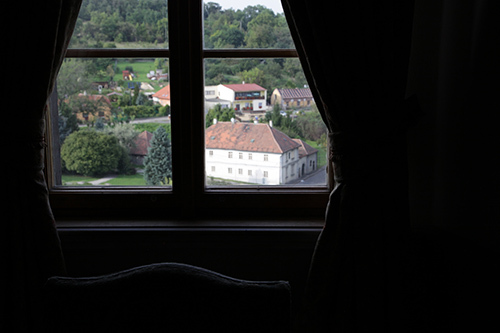 For not only were we in the room where Dvořák was born, but we looked out the window at yet another Lobkowicz castle. And, as we entered the little house to visit and play some music, in the door behind us came William himself, whose family, unbelievably, also owns this historic Dvořák house. 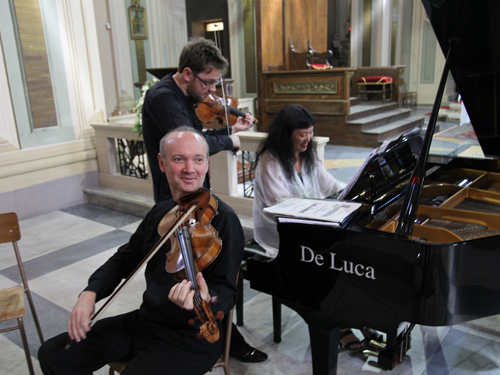 Sean and Wu Han and I quickly set up around the grand piano, and after a couple of introductory words, we played one of the most magical movements Dvořák ever composed: the third movement of his incomparable “Dumky” Trio. 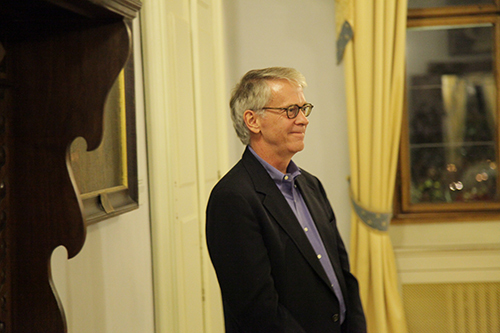 In our audience was not only William Lobkowicz, but also the eminent musicologist, author and Dvořák expert David Beveridge, an American resident of Prague, who served as one of Music@Menlo’s Encounter leaders last summer. 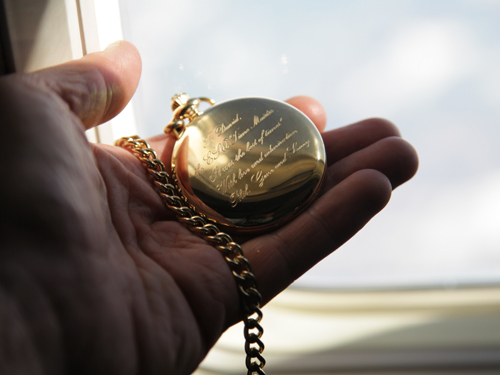 Within the first notes of piece, we all knew once again that we were in the midst of a defining moment of the trip, privileged through our relationships and connections to be a part of something that few others must have ever enjoyed. To say it was unforgettable is of course an understatement, and once again, there are no words that can adequately describe the experience. 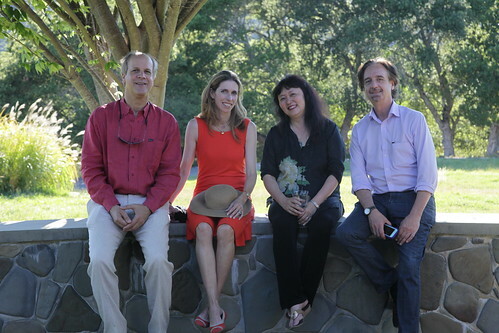 Before we left the house, Wu Han coaxed Chamber Music Society board member and serious pianist Paul Gridley to join her for an impromptu reading of some four-hand music by Dvořák. His fellow travelers were amazed and delighted. Dvořák’s father was the town butcher and ran a small tavern as well. 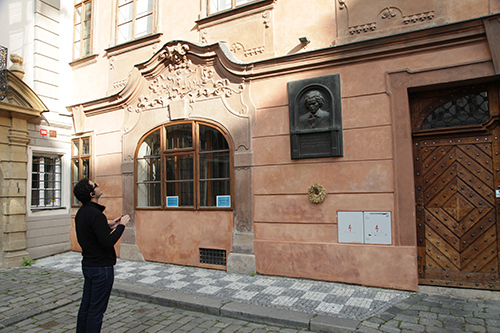 A few steps across the street from the house is the tiny church where Dvořák first performed music. 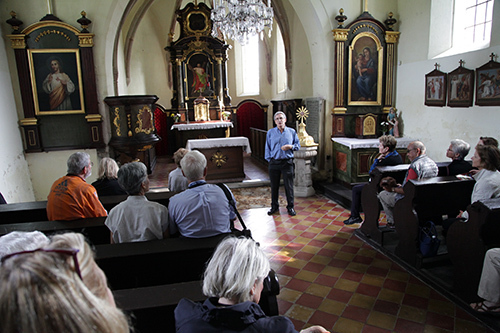 Dvořák was baptized in the font to the right of David Beveridge, who spoke to us about Dvořák’s early life in this most contextual of settings. A few more steps behind the chapel, next to the Moldau River, runs the train line that was built during Dvořák’s childhood and from which, it is assumed, he developed his fascination with trains. The line was the first to connect Dresden and Prague. The corner of the Lobkowicz palace is visible to the right. There was time for a quick musician portrait in front of Dvořák’s house before boarding the bus for the palace. 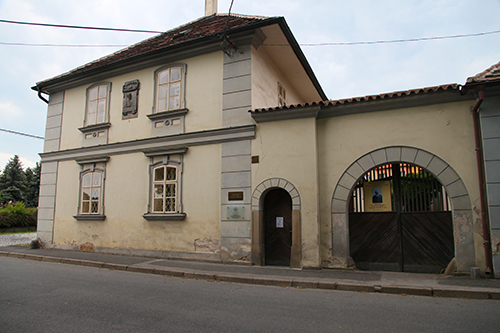 The Dvořák birth house sits on a small street that leads directly to the imposing Lobkowicz Palace. As one approaches the palace, its magnificence overwhelms, as it must have all the residents of this tiny town since it was built in the 16th century. 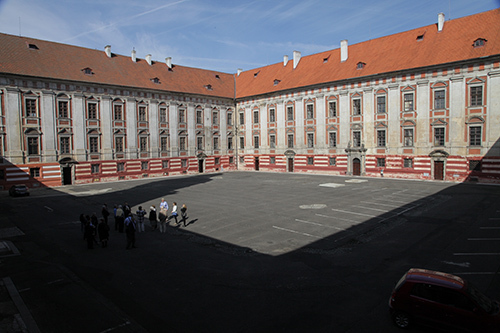 A grand courtyard greets visitors after they pass over the drawbridge and through a tunnel. 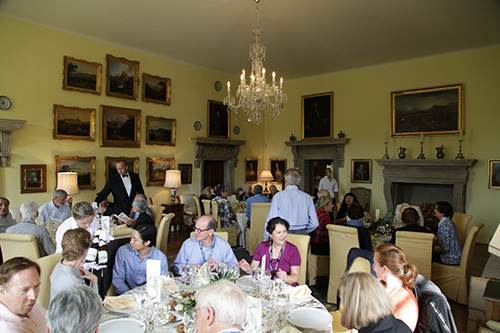 Although we were all anxious to tour the palace, another sumptuous meal awaited us, accompanied by plentiful Lobkowicz wine, and served elegantly by waiters wearing white gloves. 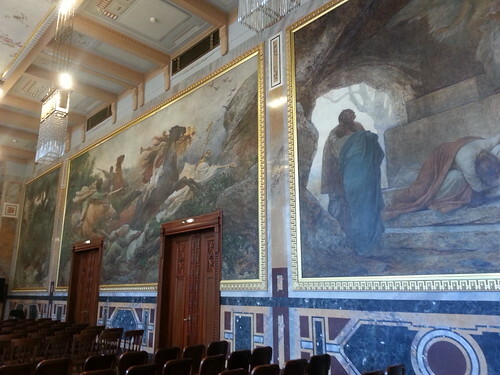 Everywhere you looked, there were beautiful paintings to stare at, often depicting the surrounding area. I remembered the palace well, as several years earlier William had showed me through it himself. I dutifully respected the staff’s request for no photos and all I can say is that one must go there anyway to really absorb the experience. The family very smartly chose to set this palace up as a model of how they lived there in the 19th century. The stunning exhibition, titled Private Spaces: A Noble Family at Home, is beautifully executed, with contiguous rooms allowing us to be inside the elegant dining room, the bedrooms, smoking room, drawing room, family chapel and rooms devoted to hunting and the arms required, a necessary pastime for a family subsisting off the land. Through the music room window, the Dvořák house is perfectly framed below. 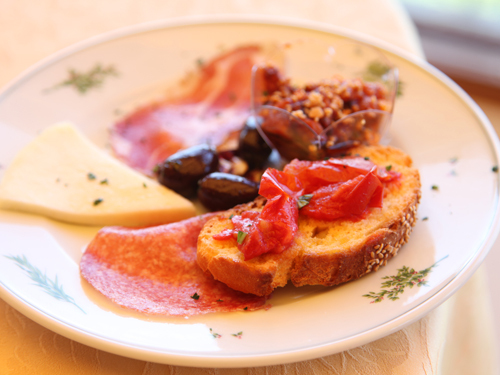 It is more than likely that the Lobkowicz family purchased meat and goods from Dvořák’s father. Our guided tour included a special presentation of important musical items from the vast collection, including a letter from Beethoven, held in front of us close enough to touch (but we resisted). It was at about this time that Wu Han and I began to receive signals from our tour organizers that we had fallen pretty far behind schedule. 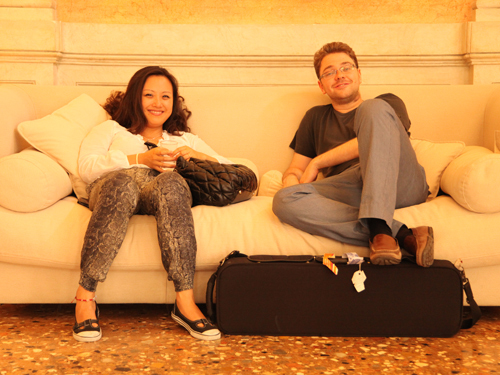 It was almost impossible to draw our travelers – especially the musicians – away from the music collection, but we needed to get back to the hotel to change and prepare ourselves for the evening’s concert at Vila Amerika. That never happened. Traffic was such that by the time we got into Prague the sun was just dipping behind the famous church towers of the Town Square. A unanimous decision was taken to forego the refreshing and head directly to the Vila Amerika for the concert. We had our instruments with us anyway, and at this point, nothing to lose. 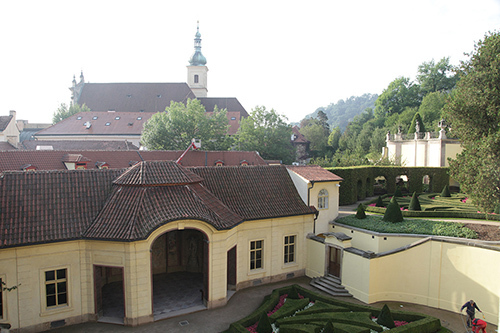 Vila Amerika, an ornate Baroque residence once the site of numerous high-society activity, now houses the Antonin Dvořák Museum, which was established there in 1932. 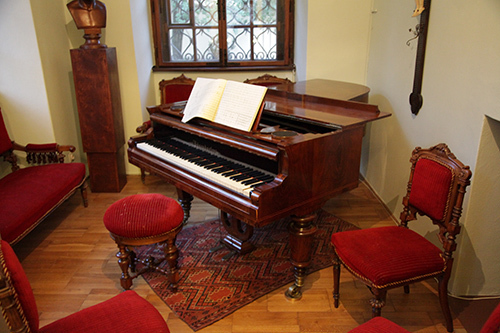 The museum contains many important documents and artifacts, such as Dvořák’s own piano. The concert took place in a beautiful room on the second floor, where we soothed our tired travelers with the Brahms e minor cello sonata and the complete Dvořák Dumky Trio, for which Sean Lee joined us, playing magnificently without even a moment’s warm up. Thankfully, the bus awaited us for transport to our beautiful hotel for a much-needed night’s sleep. Rehearsals and private practice obligations necessarily deprive us musicians of the total tour experience, and we are forced to pick and choose what to see and what must wait until our hopefully eventual return to the many incredible places our tours and cruises take us. Friday’s activities constituted an all-day walking tour of the Prague city center, and I elected to only take part in a portion in order to devote time to the cello and the music I would be performing. Therefore, I apologize that my blog of a tour is never quite complete, but I do try to make up the difference when I can. The portion of the walk that I joined wound through small streets with hidden surprises, such as this hotel where Beethoven had stayed. Such are the amazing discoveries to be made, over and over again, in this incredible city. As we crossed the storied Charles Bridge, we looked up again, in amazement, at the Prague Castle, and the imposing palace of the Lobkowicz family, where we had dined with William and Alexandra, and where we would return for our final concert and dinner on Sunday (the yellow portion on the far right with the red pointed tower is the Lobkowicz Palace). The one portion of the day that I just couldn’t miss was the private tour of the Estates Theater (the name “Estates” refers to the Enlightenment sentiment that all classes of society (estates) should be afforded access to privileges such as cultural entertainment). 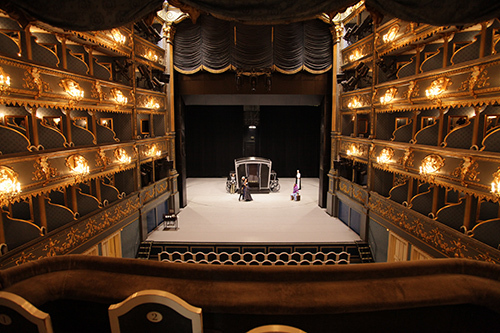 This magnificent 18th century theater is one of the world’s prime musical sight-seeing destinations, chiefly because of the presence of Mozart and the historic performances of his operas, including the world premieres of Don Giovanni and La Clemenza di Tito. The inside is like a jewel box, and it’s absolutely incredible to sit in it, imagining Mozart right there in front of you on the podium. We were lucky to enjoy our own private tour of the historic theater. 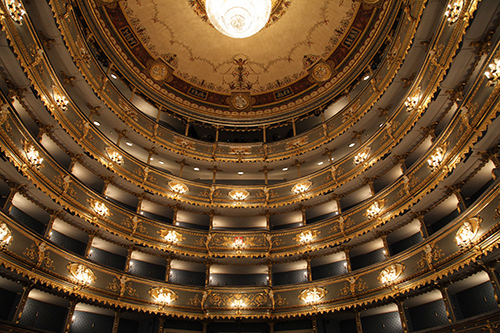 The ceiling and the ornate box seat enclosures are enough to take your breath away. 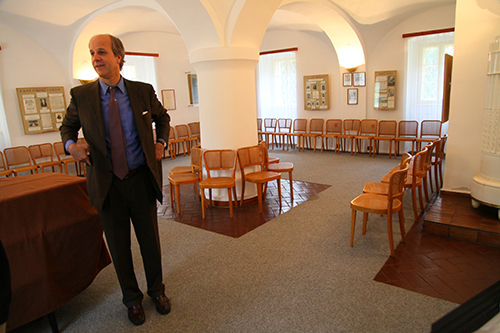 This visit to the museum was the direct consequence of my having been there two years prior, also at the instigation of David Beveridge (who is known and respected by the staff) during which Philip Setzer and I studied the manuscripts to Dvořák’s Dumky and f minor piano trios, and I the famous, incomparable Cello Concerto. That was a peak experience that I had vowed to repeat, next time in the company of Wu Han and more musician colleagues, and I’m immensely gratified to say that on this day, my dream came true. Under the watchful eye of David, we cautiously removed the precious manuscripts from their boxes. Protective gloves are required procedure for anyone touching this music: These were the actual composition scores. You can see where Dvořák changed this and that as he went along, and recorded the dates that he began and finished each movement. 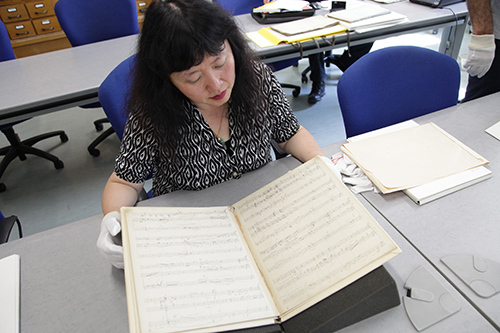 Wu Han looked at the manuscript of the Sonatina for Violin and Piano, composed during Dvořák’s American visit, in reverent astonishment. The discoveries one makes upon seeing the original manuscript of a composer can be life-changing. The excitement in the room was at fever pitch, as one of us poured over Dvořák’s Violin Concerto, another over his “American” Quintet, and me over the “American” string quartet, a piece I must have played a thousand times. One can only imagine the thrill I had holding the papers onto which those now-beloved ideas were first set down. We all agreed on one point as we left: as fantastic and multi-faceted as the trip had been so far, the experience we shared with Dvořák’s music in that little room would have been, for us, enough reason to make the journey right there. We all realized that we were, that afternoon, four very lucky and privileged musicians, and for that I must again thank David Beveridge for making this extraordinary moment possible. After the briefest of stops back at our hotel, we headed out again to the National Theater (opened in 1881) for a performance of Dvořák’s most famous and often-performed opera, Rusalka, composed in 1900. 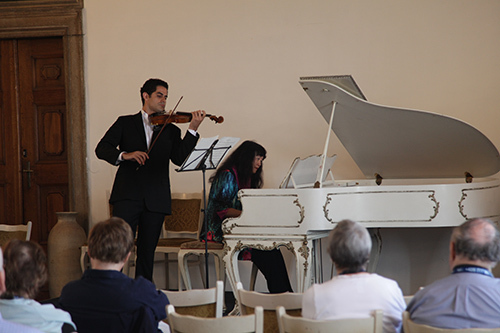 Once again, we were in an historic performance space, where the young free-lancer Dvořák had played viola in the orchestra under the direction of the “father” of Czech music, Bedřich Smetana (Dvořák had previously played viola in the Estates Theater orchestra as well). A Rusalka is a kind of un-dead mermaid, living on the bottom of the river, who comes ashore at night and lures men to their deaths. 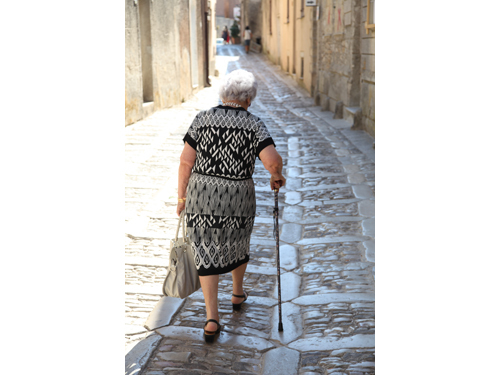 They are, according to some legends, women who have died prematurely under tragic circumstances who return among the living to seek justice or revenge. In Dvořák’s opera, Rusalka falls in love with a prince who is hunting near her lake and all I’ll say is that it doesn’t turn out too well for him in the end. Dvořák’s music, however, is mature and masterful, this being his final creation for the stage at the height of his maturity. The evening proved to be yet another incomparable experience in a string of many since our arrival only five days earlier. Once again, regrettably, I had to stay back to practice for our final concert the next day, but our curious and tireless group headed out again in the morning to the Old Town for more sightseeing. 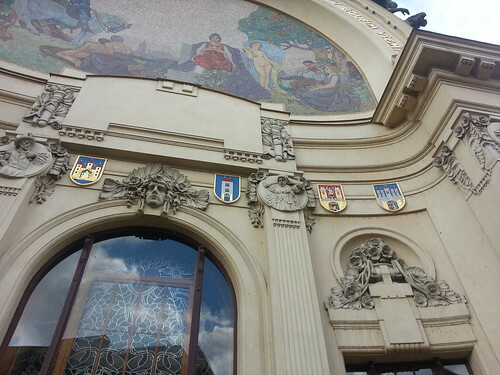 The group’s first stop was Wenceslas Square, and then to the Mucha Museum, as in Alphonse Mucha (1860-1939), the definitive Art Nouveau artist. 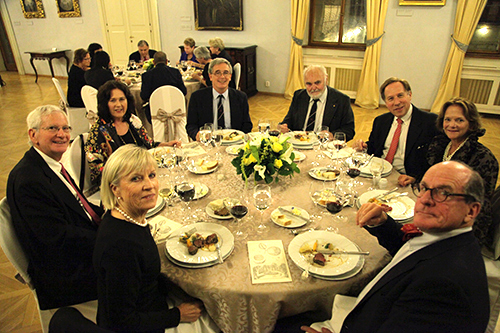 The group then continued to the iconic Municipal House, the location of Smetana Hall and also the famous restaurant Francouska, where an elegant lunch was served. 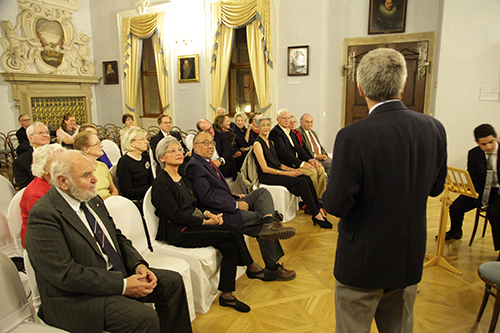 That evening, the group returned to the Estates Theater for a performance of The Marriage of Figaro, composed by Mozart in 1786 and premiered in Vienna in the same year, to a moderately appreciative audience. Later in 1786, however, it was presented in Prague to frenzied acclaim. No wonder Mozart loved this city and its people and musicians! Such was its popularity that music fans in Prague actually pooled their money to pay the composer’s way to visit and hear the production, which is what Mozart actually did, finally conducting one of the performances himself. 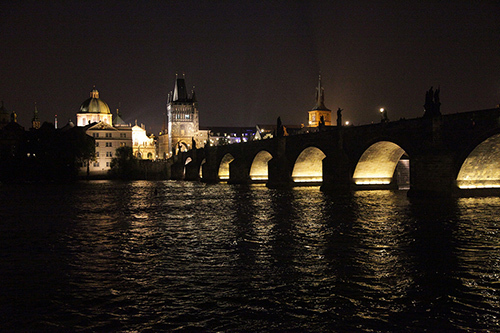 Although we automatically think of Dvořák when Prague is mentioned, it pays to remember that almost a century before Dvořák , the famous Austrian composer set a standard for composition that has rarely been challenged, and in some ways, never equaled. Brahms called Figaro “a miracle”, and prophesied that nothing like it would ever be done again. How right he was. By all accounts, the performance was well done, and once again, I wish I had gone! As our final day crept us on us, all too soon, our group, including the musicians, were in a state of high anticipation for the festivities of our last evening. 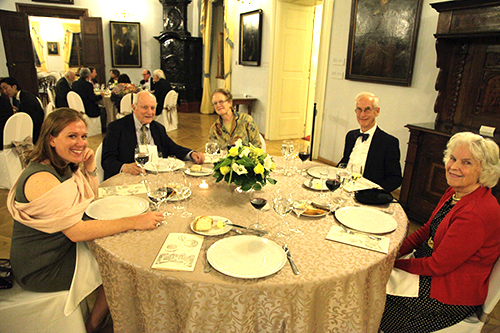 A concert at the Lobkowicz Palace in the Prague Castle would be followed by dinner there as well, and we knew that once again, as had happened so many times during the week, we were about to experience something unique and incomparable and, for us, unprecedented. Upon the musicians’ early arrival at the palace for rehearsal, we were stunned by the beauty of the Music Room, watched over by the definitive portrait of Josef Franz Maximilian Lobkowicz himself. Upon emerging from our dressing room (which happened to be the palace chapel) into our gathering audience, I was confronted with an absolutely astounding sight. 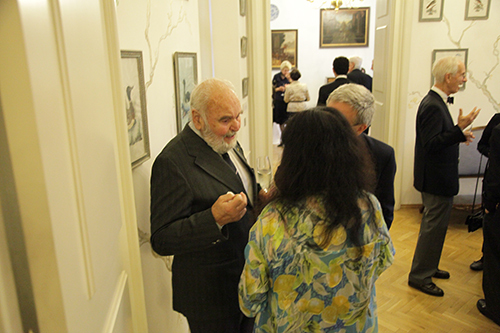 Talking to Wu Han and David Beveridge was the grandson of Dvořák himself, also named Antonin. If there was ever a spitting image of anyone, it is him. I think we all experienced a shocking, out-of-body experience in his presence. 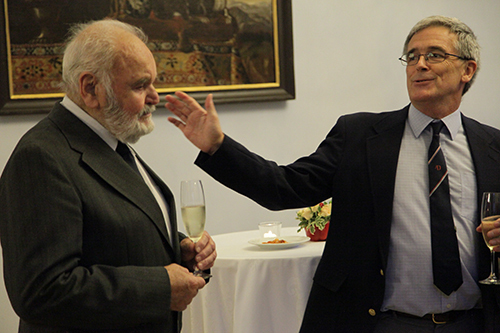 Especially in the period setting of the palace, it was like talking to Dvořák the composer. David Beveridge graciously introduced him, and our crowd, me included, simply couldn’t stop staring at him in disbelief as he treated us to a charming little greeting speech, in accomplished English, just like his grandfather. As soon as it was determined that Antonin III was not only accessible but lovable, he was besieged by the group, and I must say, looked very happy. 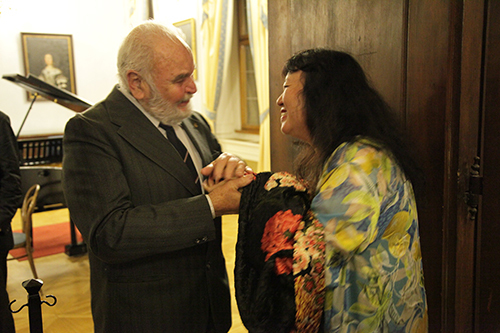 There was not a soul in the room who didn’t want to get close to him and have their picture taken with someone named Antonin Dvořák, in the heart of Prague, and who can blame them? I finally gathered everyone for a group shot, and, not to be left out, “photoshopped” myself in later. 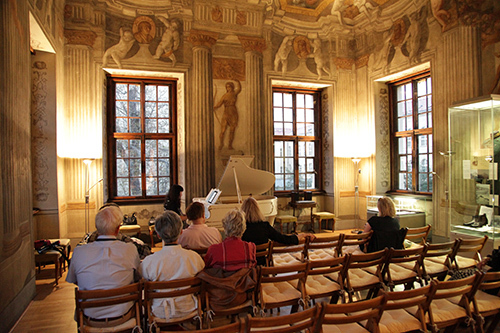 The musicians quickly ducked out and back into our ornate warmup room to get ready for the concert. Sean and Arnaud were appropriately inspired by our surroundings. It was quite a setting for the musicians: Josef Franz Maximilian Lobkowicz watching us from the back, and Antonin Dvořák III a few feet away in the front row. There are times when we can all sense an experience of a lifetime, and this was definitely one of mine. David Beveridge spoke about the music we were to perform: Smetana’s heart-rending Piano Trio, and Dvořák’s beloved Piano Quartet. To the best of my knowledge, the concert went off without a hitch. Our colleagues Arnaud and Sean performed magnificently, as they had in every instance on the tour despite its hectic schedule. They are artists in the truest sense of the word: great instrumentalists, deeply committed and probing musicians, and two of the nicest people and dearest friends we’ve ever had. We are used to greeting well-wishers after concerts, but this sight will remain among the most moving memories of my entire life. To think she had, moments before the photo was taken, performed one of his grandfather’s greatest chamber works. Group portraits like this don’t happen every day. Notice that even Prince No. 7 is in there as well. We moved to the next room, which was set up for dinner. Speeches began to acknowledge those who had contributed so much to our trip. Among them was Peter Straus, head of The Grand Tour travel company (www.thegrandtour.com) which organized everything and did a spectacular job. Peter’s company specializes in cultural touring and we were lucky to have the personal attention of Peter himself on our tour. During a break between courses, Antonin came over to our table with small gift for us. 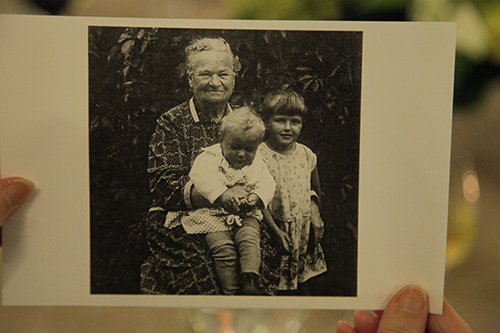 It was a copy of a rare photo of him seated with his Grandmother, the composer’s wife. He then backed up, whipped out his camera and took my picture. 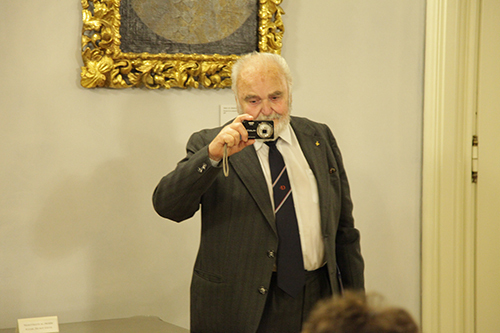 I can now tell people that Antonin Dvořák took a picture of me and I’m telling the truth. How cool is that? 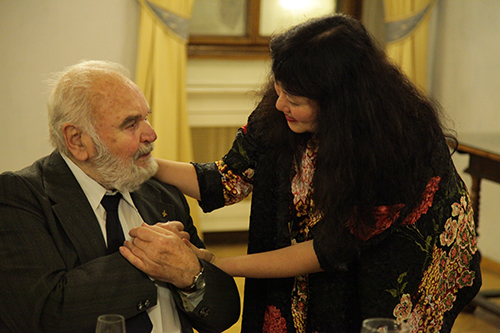 There were a lot of long goodbyes at the end of this dinner, among them a heartfelt one between us and Antonin. He asked “May I call you David?” to which I responded “Yes, and may I call you Antonin?” putting me on a first-name basis with Antonin Dvořák. I guess I can only excuse my obsession with this gentleman as based on my tremendous love and reverence for his grandfather’s music, for all the pleasure (and work!) it has provided me during my life, and that perhaps, because of the setting, uncanny resemblance, and identical name, well, it was like talking to the composer himself. 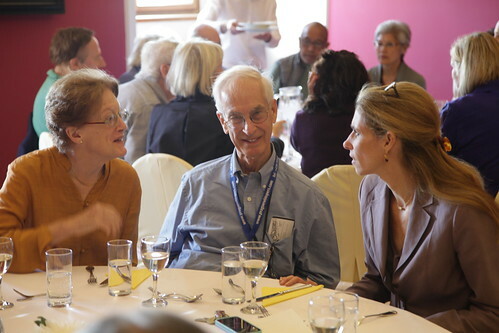 David Beveridge, who supplied us with privileged information, connections, insight and his personable company, cannot be thanked enough. He provided an essential scholarly element for which there is no substitute, and did a magnificent job. Annie Rohan (Music@Menlo) and Sharon Griffin (CMS), who bore lions’ shares of communication with our travelers and were there, tirelessly, to assist during our tour with every need our patrons had. 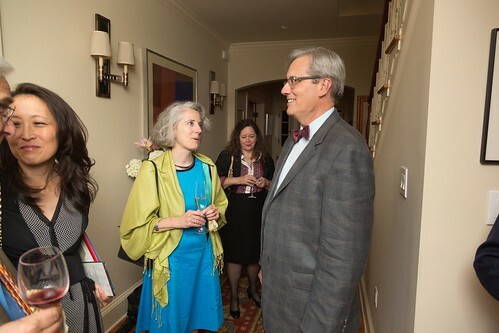 Alexandra and William Lobkowicz, for opening their residences to us for special access, authorizing and providing for extra talks and informative exhibits, and for our continued friendship and mutual interests in music and the Lobkowicz legacy. 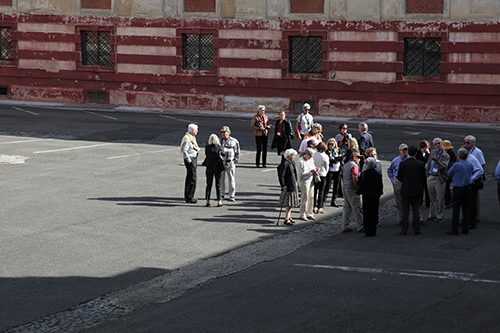 The wonderfully helpful staffs of the Lobkowicz locations – Prague Castle, Roudnice and Nelahozeves – were equally essential in making our visit extraordinary. Our colleagues Sean Lee and Arnaud Sussmann: I can’t imagine playing with more wonderful musicians and better friends. They inspired us all beyond words. Although the amazing week came to a sudden end, the resonance of the visit to Prague is still ringing loud and clear in my head, and I imagine in many others as well. All during the fall season, Wu Han and I have been receiving thanks and compliments and testimony from those who were with us. 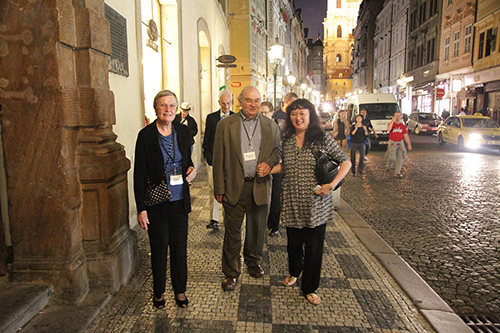 It was our first music tour project, designed by us in collaboration with Peter Straus and his company, and was inspired directly by our own extraordinary experiences in Prague, our wonderful relationship with the Lobkowicz family, our working friendship with David Beveridge, and of course our intimate involvement with the music of the great Czech composers. It was an enormously gratifying experience, and it has inspired us to dream of what we might do next in this vein. Certainly, it’s a new product line for me and Wu Han, in addition to performing, programming and teaching, but no one seems surprised at our restlessness and willingness to extend ourselves into new territory for something in which we believe so strongly. 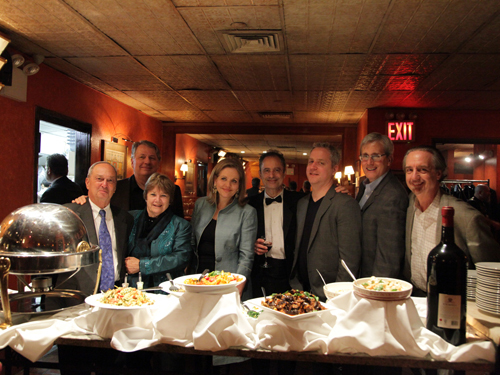 The Chamber Music Society of Lincoln Center (CMS) and Saratoga Performing Arts Center (SPAC) are proud to announce CMS at SPAC, a new partnership in which CMS will become SPAC’s resident chamber music ensemble, beginning in August 2014. In establishing the history-making relationship, CMS joins the Philadelphia Orchestra and Lincoln Center colleague, the New York City Ballet, in making SPAC its summer home. CMS will program and perform the traditional three-week, six-concert Saratoga Chamber Music Festival, now entitled, The Chamber Music Society of Lincoln Center at SPAC, beginning in August 2014. The concerts that we are designing for this exciting new venture will present the repertoire and artists that are making The Chamber Music Society of Lincoln Center the most talked-about organization of its kind. Add to the mix a community dedicated to the performing arts, the idyllic setting and superb acoustics of the Spa Little Theater, plus the major commitment of SPAC to an ongoing partnership, and we see the perfect chemistry for the emergence of a world-class chamber music festival. CMS is excited to call SPAC its first summer home, and we look forward to musically and personally becoming a part of the Saratoga Springs community. Saratoga Performing Arts Center, established in 1966, is a vibrant cultural destination located in Saratoga Springs, New York, playing host to national and international audiences, as well as those from upstate New York, the Hudson Valley, Vermont, the Berkshires, Connecticut, and nearby Canada. Chamber music performances have been a part of the summer tradition at SPAC since its opening season, when members of The Philadelphia Orchestra performed in a chamber music series in Saratoga’s Congress Park. 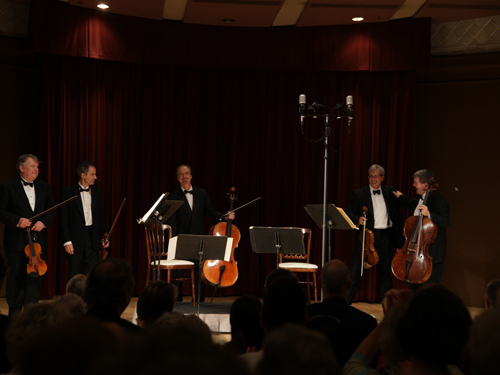 In the succeeding years, SPAC offered chamber music in a variety of locations and formats in an effort to meet growing audience interest in the art form. 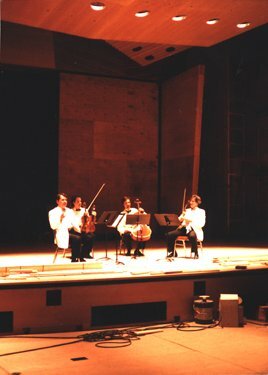 In 1991, chamber music was established as a permanent part of SPAC’s season with the appointment of Canadian violinist Chantal Juillet who founded the Saratoga Chamber Music Festival at the 500-seat Spa Little Theatre. Today we celebrate a seminal event in the history of Saratoga Performing Arts Center: the launch of a new artistic partnership with The Chamber Music Society of Lincoln Center, the nation’s premier chamber music organization. This new residency represents an unprecedented investment in SPAC’s chamber music programming and a deepening of our mission to present and promote a breadth of world-class cultural opportunities. 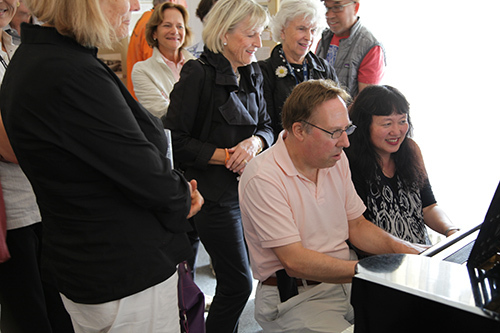 David Finckel and Wu Han, world-renowned classical musicians, are equally dynamic in their roles as the artistic leaders of CMS. 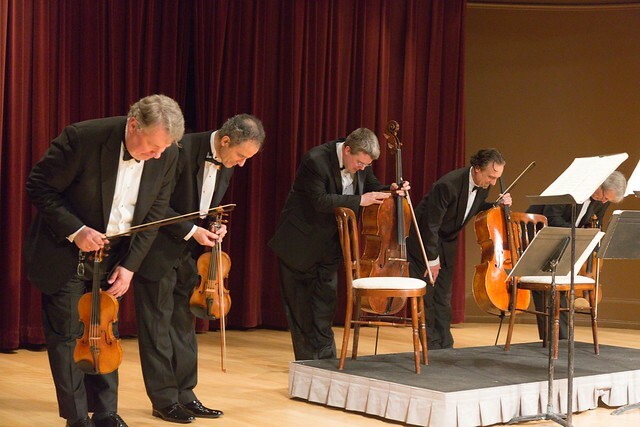 Their talent, energy, and imagination have established the organization as one of the greatest success stories in the performing arts; through performances, educational outreach, and broadcasts, CMS draws more people to chamber music than any other organization of its kind in the world. That impact is poised to grow through this exciting new partnership. We welcome and encourage fans in the Northeast and beyond to make plans now to join us at SPAC in 2014 for the spectacular inaugural year of this new series and to experience firsthand, chamber music artistry and innovation at its finest. The CMS residency at SPAC will kick off on August 11th and continue through August 26, 2014 in the intimate Spa Little Theatre. Spanning three weeks, performances will take place on August 11, 12, 17, 19, 24, and 26. Artist and repertoire details will be announced in the coming weeks. With this unprecedented partnership with SPAC, CMS realizes a cherished goal of an annual summer festival presence in the U.S., thereby increasing its audience-reach and year-round visibility as a leading international destination for chamber music. 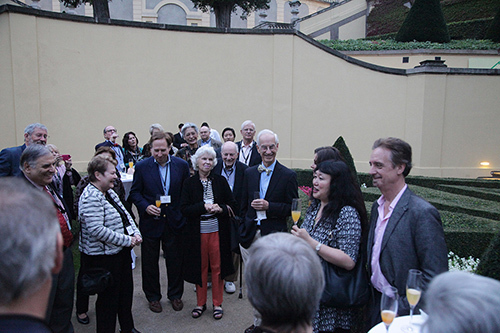 The SPAC summer residency is an important and significant addition to CMS’s national and international performance profile, which has seen tremendous growth under the inspired leadership of David Finckel and Wu Han. Saratoga Performing Arts Center, located in the historic resort town of Saratoga Springs in upstate New York, has established a reputation as one of America’s most prestigious summer festivals. Just three hours from Boston, New York and Montreal, SPAC presents its world-class summer programming at two locations within the breathtaking 2,400-acre Saratoga Spa State Park: at its 5,200-seat open-air amphitheatre and at the intimate 500-seat Spa Little Theatre. The summer season features programs by its resident companies, the New York City Ballet and The Philadelphia Orchestra, as well as the legendary Freihofer’s Saratoga Jazz Festival and concerts by Live Nation. In 2014, SPAC will celebrate a landmark event as it becomes the summer home of the Chamber Music Society of Lincoln Center. The Chamber Music Society of Lincoln Center (CMS) is one of eleven constituents of Lincoln Center for the Performing Arts, the largest performing arts complex in the world. 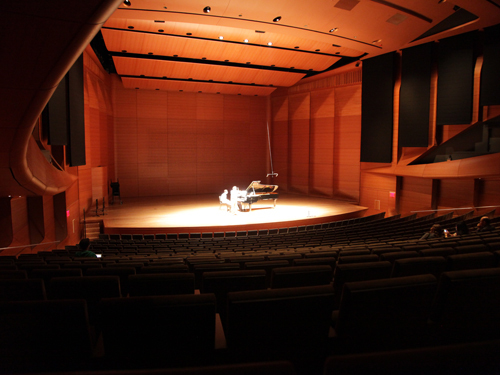 Along with other constituents such as the New York Philharmonic, New York City Ballet, Lincoln Center Theater, and The Metropolitan Opera, the Chamber Music Society has its home at Lincoln Center, in Alice Tully Hall. CMS presents annual series of concerts and educational events for listeners ranging from connoisseurs to chamber music newcomers of all ages. Performing repertoire from over three centuries, and numerous premieres by living composers, CMS offers programs curated to provide listeners a comprehensive perspective on the art of chamber music. 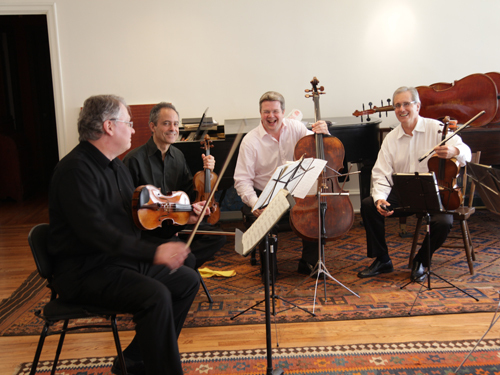 The performing artists of CMS, a multi-generational and international selection of expert chamber musicians, constitute an evolving repertory company capable of presenting chamber music of every instrumentation, style, and historical period. 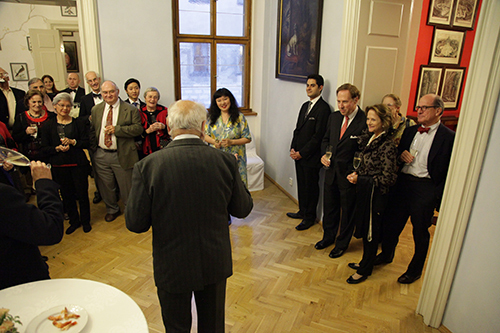 The annual activities of CMS include a full season of concerts and events, national and international tours, and annual performances at eight residencies around the world. 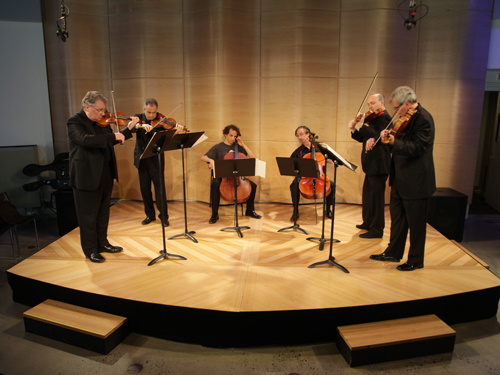 CMS’ artistry is supported by numerous live-streamed concerts, lectures, and master classes, nationally televised broadcasts on Live From Lincoln Center, an international, year-round radio series, and regular appearances on American Public Media’s Performance Today. 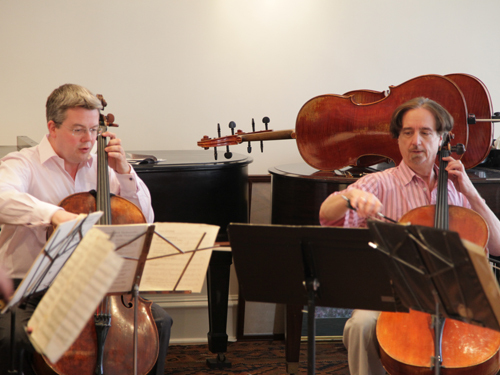 In 2004, CMS appointed cellist David Finckel and pianist Wu Han artistic directors. 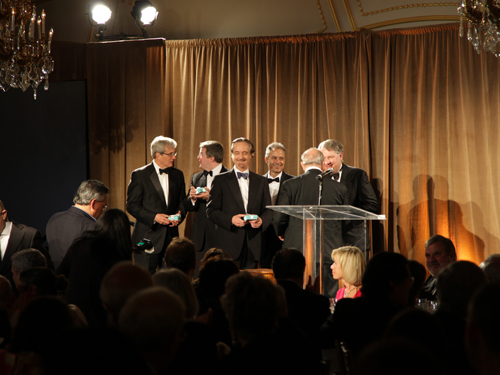 They succeed founding director Charles Wadsworth (1969-89), Fred Sherry (1989-93), and David Shifrin (1993-2004). 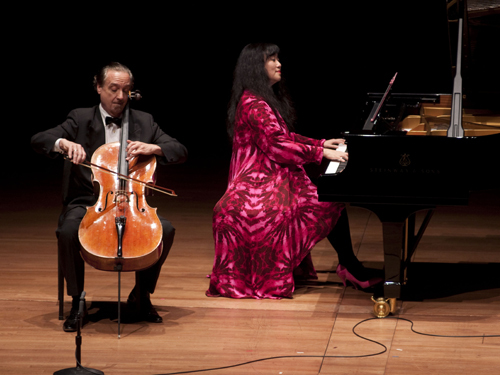 Cellist David Finckel and pianist Wu Han, Musical America’s 2012 Musicians of the Year, rank among the most esteemed and influential classical musicians in the world today. The talent, energy, imagination, and dedication they bring to their multifaceted endeavors as concert performers, recording artists, educators, artistic administrators, and cultural entrepreneurs go unmatched. 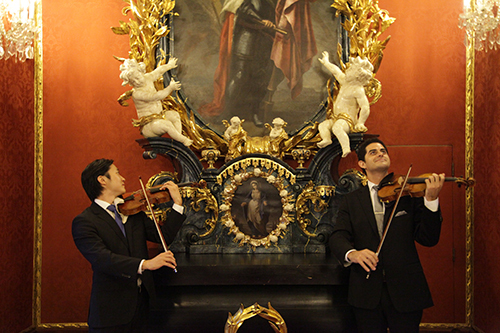 In high demand year after year among chamber music audiences worldwide, the duo has appeared each season at the most prestigious venues and concert series across the United States and around the world to unanimous critical acclaim. 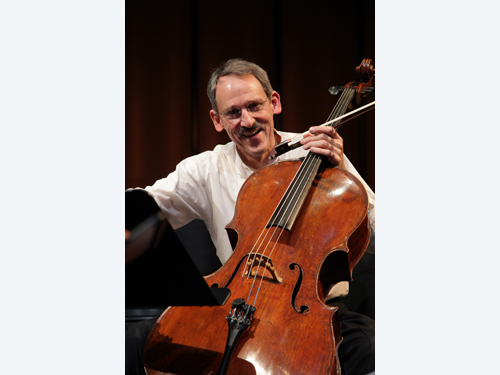 For thirty-four years, David Finckel served as cellist of the Grammy Award-winning Emerson String Quartet. 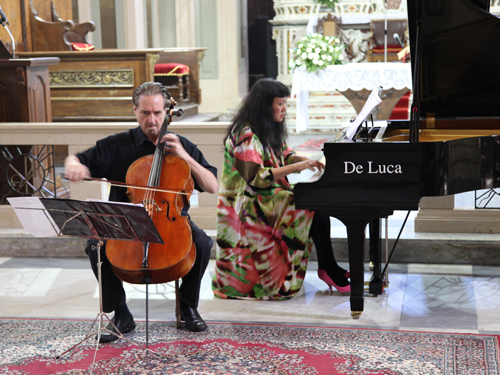 David Finckel and Wu Han’s wide-ranging musical innovations include the launch of ArtistLed (www.artistled.com), classical music’s first musician-directed and Internet-based recording company, whose catalogue of sixteen albums has won widespread critical acclaim. 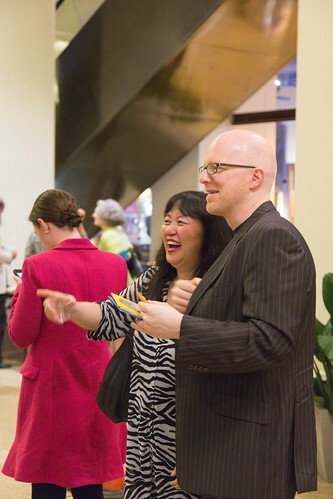 David Finckel and Wu Han are the founding Artistic Directors of Music@Menlo, a chamber music festival and institute in Silicon Valley now in its eleventh season, and have served as Artistic Directors of The Chamber Music Society of Lincoln Center since 2004. 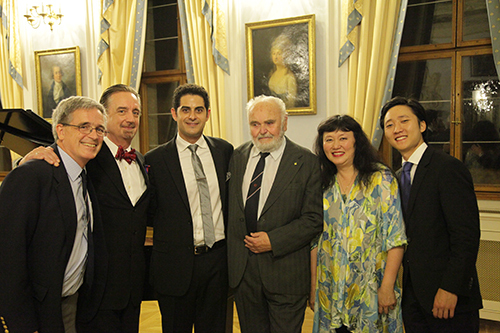 In 2011, David Finckel and Wu Han were named Artistic Directors of Chamber Music Today, an annual festival held in Korea, and David Finckel was recently named Artistic Director and honoree of the Mendelssohn Fellowship, which identifies young Korean musicians and promotes chamber music in Korea. 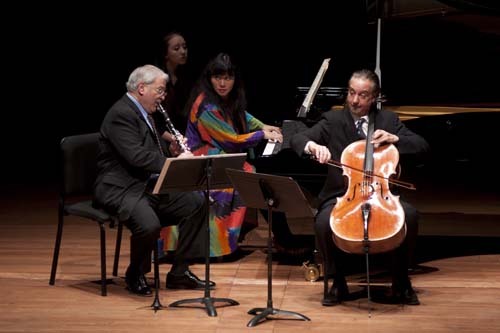 In these capacities, as well as through a multitude of other education initiatives, such as their newly created chamber music studio at Aspen Music Festival and School, they have achieved universal renown for their passionate commitment to nurturing the careers of countless young artists. 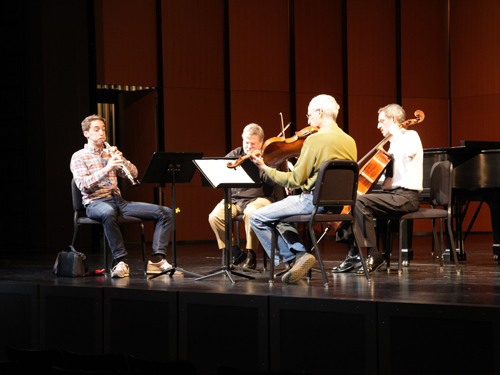 In addition, David Finckel serves on the faculties of The Juilliard School, and Stony Brook University. 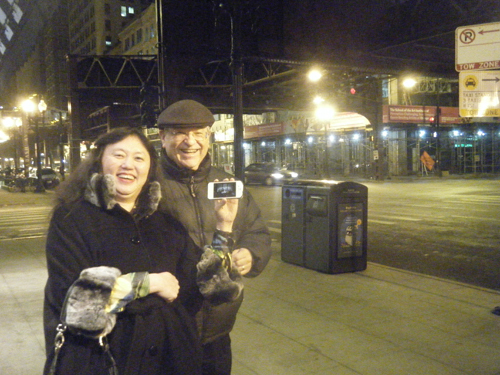 David Finckel and Wu Han reside in New York City. For more information, please visit www.davidfinckelandwuhan.com. In a single, momentous week in May, David Finckel performed in numerous cities in a variety of roles. Here is his account of seven days, including his various concerts and the definitive, insider’s report on his long-awaited departure from the Emerson String Quartet. The opportunity to perform in Carnegie Hall is every musician’s dream. I’ve been fortunate to play there many times, and my momentous week began in the Stern Auditorium (the main stage) in a concert belonging to soprano Renée Fleming, who had invited us to appear on the final performance of her Carnegie Hall Perspectives series. 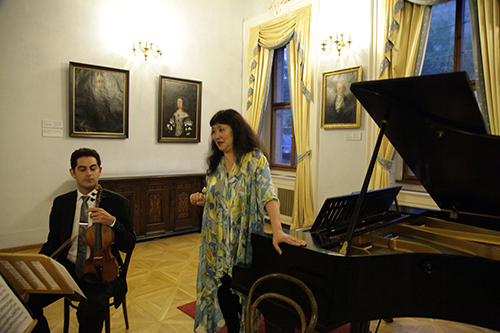 In her intriguing program entitled “Window to Modernity”, she presented music from the transitional period between the Romantic and Modern eras, beginning with late Brahms and exploring music generated from the Second Viennese School. Along with songs by Zeisl, Wellesz, Wagner, and Weigl, we performed Schoenberg’s Transfigured Night with colleagues from our recent recording, Paul Neubauer and Colin Carr. 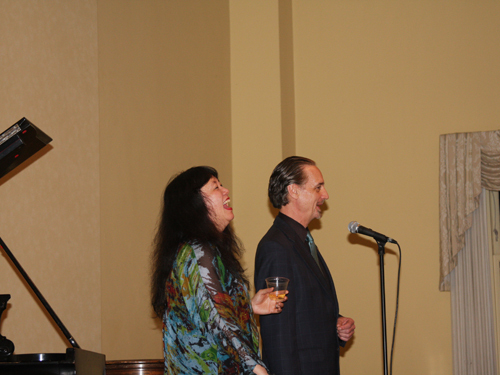 Pianist Jeremy Denk appeared with Renée in various repertoire, and performed two pieces from Brahms’s Op. 118. Renée hosted the concert, speaking about the music to the audience during the many complex stage changes. 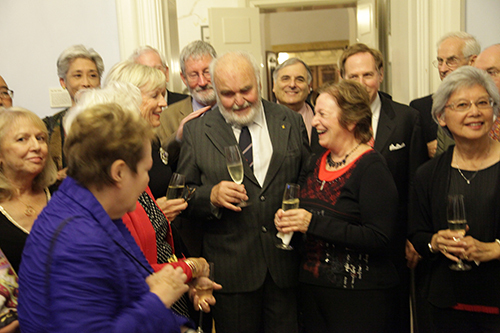 At the post-concert reception, the musicians gathered with audience members Ronald Schoenberg and Barbara Zeisl-Schoenberg, the children of the composer. Ronald resembles his famous father very strongly. 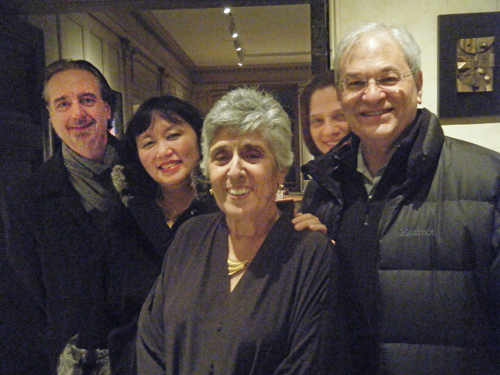 The next morning, Philip Setzer, Wu Han and I left early for the Ladies Morning Musical Club series in Montreal. A longtime venue for the Emerson Quartet, and more recently our trio, we were welcomed for our second appearance that included performances of Haydn’s A major Trio, Dvorak’s “Dumky” Trio, and Mendelssohn’s d minor Trio. Artists who perform for this series, which is held in the wonderful Pollack concert hall at McGill University, are always treated to the best of care and feeding. As the concert ended by 5 p.m., we managed to return to New York that same evening. 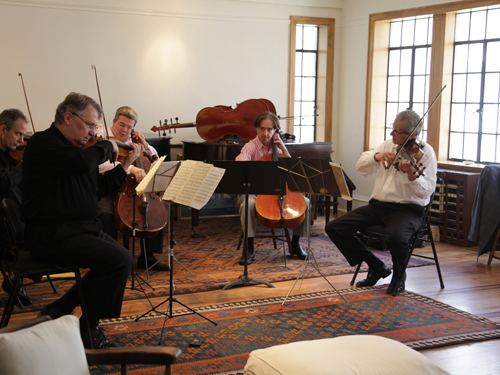 After meetings which began at 8:00 a.m. and ran until lunchtime, Wu Han and I welcomed Gene, Phil, Larry and my Emerson Quartet successor Paul Watkins to our newly-expanded living room to rehearse the Schubert Cello Quintet. We were performing the Quintet at both the Chamber Music Society gala that night, and for my final concert with the Quartet the following Saturday. It was the first time we got a look at the new ESQ. The rehearsal was wonderful: intense, musical, friendly, joyful and celebratory. A video of the performance can be found here. 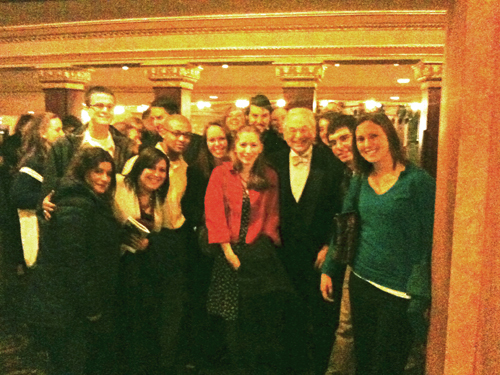 After the performance and interviews, we were whisked past a throng of enthusiastic Emerson fans who had turned out to see my last public performance with the quartet in New York, into a van for a swift trip to the St. Regis Hotel, site of the CMS spring gala. The room at the St. Regis is elegant and held 26 tables purchased by patrons and CMS board members, each of whom invited their own guests. 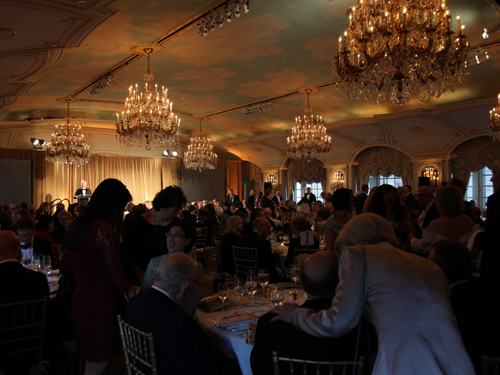 Our gala chairs were James and Melissa O’Shaughnessy, Joan Harris, Elizabeth Smith, and Erwin and Pearl Staller, and the room was filled with an international collection of Emerson Quartet fans who had turned out to honor the quartet, past, present and future, some coming from as far away as Seoul, Korea. Within minutes of our arrival, we walked onto the stage to perform the Schubert Quintet, Paul Watkins taking his first bow as the incoming cellist of the Quartet. 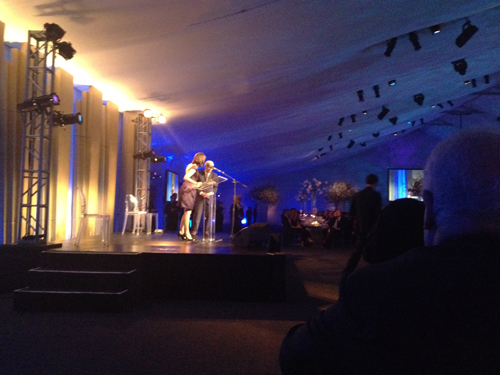 After the performance, which was rewarded with a thunderous ovation, the speeches began. We received gifts from Peter Frelinghuysen, Chairman of the Board, and the five us posed for our first picture together in public. 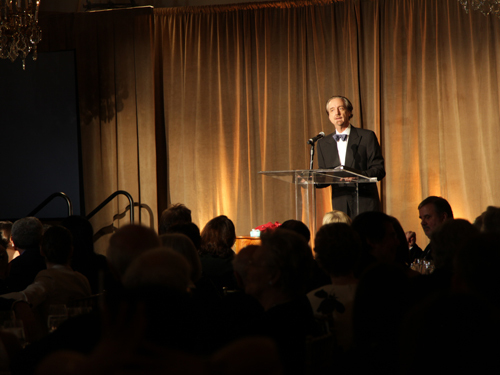 I then took the lectern to speak, paying tribute to the quartet from CMS, and, from the perspective of the Emerson, thanking CMS for its support over the years and the evening’s honor. 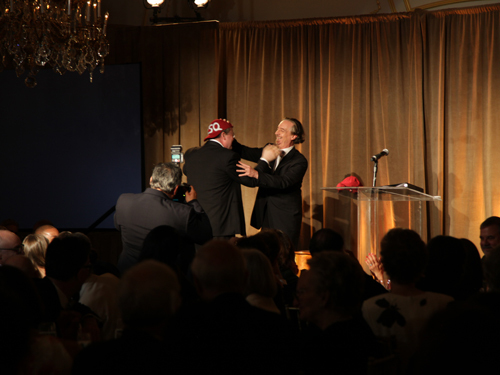 Having donned both CMS and ESQ hats during my dual-role remarks (much to the amusement of the guests) I concluded by officially welcoming Paul to the Quartet and crowning him with the ESQ hat. 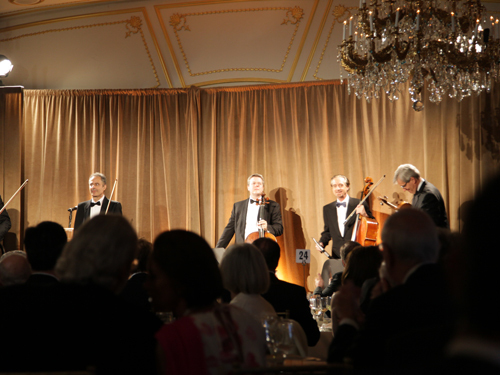 The event was a stunning success, raising a hefty sum for CMS and providing the quartet and our families – all of whom attended – with an elegant and heartwarming occasion in which to celebrate the Quartet’s many accomplishments and exciting future. Rising early after a late night with the Chamber Music Society, the four of us left for Buffalo to perform our last full quartet concert together. Fittingly, it was on one of America’s most hallowed chamber music series, which this year celebrates its 90th anniversary. We have appeared on this distinguished series many times, and our audience in this quartet-focused town has often included musical luminaries and mentors, such as Budapest Quartet cellist Mischa Schneider way back in the 1981-82 season. Upon arriving in Buffalo, we learned almost immediately that the Buffalo Philharmonic was to play in Carnegie Hall the following evening as part of the Spring for Music orchestral festival. The city was immensely proud, with signage everywhere congratulating the orchestra on its coming appearance. The Buffalo concert encapsulated many of the realities of heavy touring: Early flights for all; a lengthy, in-studio radio interview for me immediately on arrival; some crammed practicing in the hotel; an even more hectic rehearsal in which we prepared not only for Buffalo but for Washington’s concert; a very difficult program which included my last performances of Berg’s Lyric Suite, Dvorak’s d minor quartet, and Mozart’s quartet K. 499 in front of a discriminating audience; and finally, a post-concert trek back to the hotel for some Buffalo chicken wings for dinner. While my colleagues returned home to New York, I hurried to Chicago for the final performance of the Chamber Music Society’s annual series at Harris Theater. Beginning last year, the series has proved a stunning success, and our partnership with the theater has just been extended for another three seasons. We were very proud to bring to Chicago the Society’s first all-Britten program, celebrating the 100th anniversary of the composer’s birth and the first such program in the history of CMS. On the program were Britten classics and novelties, including many extraordinary works composed at the beginning of his career. Of musicians featured were the Orion String Quartet, oboist James Austin Smith, pianist Gloria Chien, tenor Anthony Dean Griffey, countertenor Daniel Taylor, and me and Wu Han, who concluded the concert with Britten’s Sonata in C of 1961, composed for cellist Mstislav Rostropovich. I played the sonata for Rostropovich when I was in my mid-teens; one of the many rare opportunities I have had to play for musicians to whom composers dedicated their works to. 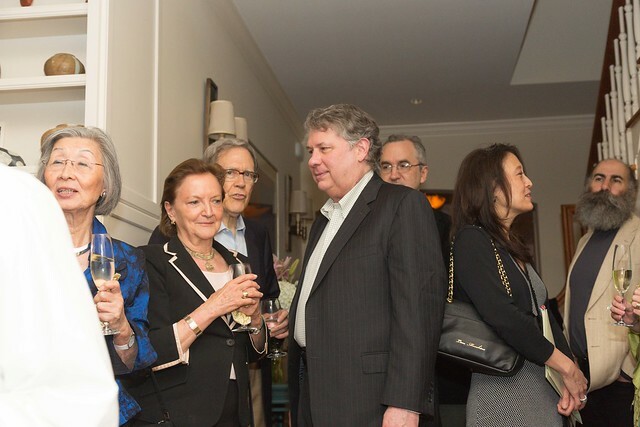 After the concert, which was attended by over 800 wildly enthusiastic patrons, we were graciously treated to a relaxed dinner in the stunningly beautiful home of Joan Harris. 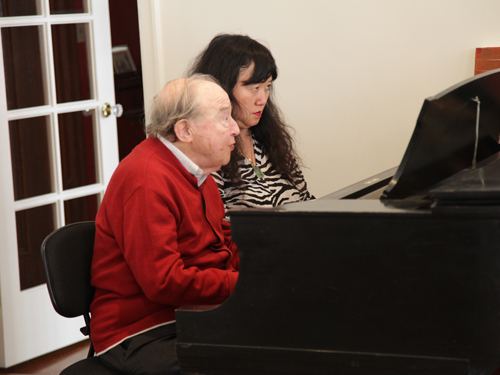 Upon our return to New York the next day on yet another early flight, we welcomed the eminent pianist Menahem Pressler to our home for lunch and a rehearsal with Wu Han. Next season, Menahem, the pianist of the Beaux Arts Trio for more than fifty years, celebrates his 90th birthday with special concerts in some of the world’s most distinguished venues. The Chamber Music Society will honor him with a concert in December, where he will be joined by Wu Han, violinist Daniel Hope, myself, and the new Emerson Quartet. 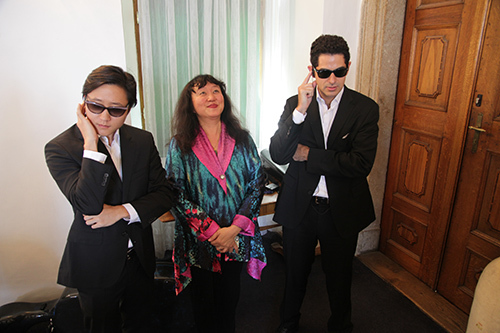 And earlier, in November, Wu Han flies to Paris to join Menahem as a four-hand partner at the Salle Gaveau. I was treated to the sounds of their Schubert as I worked in my office. After they finished, I invited Menahem to witness a poignant, personal moment in my career. While organizing my music for the coming weekend, I found that my concert binder contained only three more works that I would play with my quartet – quite a reduction from the usual thirty to forty pieces that the quartet has carried annually for so many years. But I was heartened to be able to beef up this collection with the music of my new future – trios, solo works, and a variety of wonderful chamber pieces that I will play within the next month. And once again, my concert folder felt heavy and full again, to the delight of both of us. With hardly a break, Wu Han and I dressed up to look our best and headed off for an important Lincoln Center event: the annual Lincoln Center gala, honoring the President of Lincoln Center, Reynold Levy, who will step down in December after eleven years of service. During his tenure, he has raised well over a billion dollars for Lincoln Center, and has overseen the mammoth redevelopment of the campus, which included the stunning renovation of our own Alice Tully Hall in its initial phase. Lincoln Center, and indeed all of New York, owes Reynold incalculable gratitude, and we were more than proud to have been invited to this event personally by him. The Chamber Music Society made us proud to have purchased a table, which was well stocked with our prominent board members, and we were more than thrilled to be seated by Reynold with his close friend, Lincoln Center board member Bart Friedman, former Ambassador to China, Winston Lord, and his wife, novelist Bette Bao Lord, and United States Ambassador to the United Nations, Susan Rice. We were also delighted to have a brief but ecstatic moment with two people whom we deeply admire, and who we are now privileged to count among our good friends: Ric Scofidio and Elizabeth Diller, the brilliant architects who re-imagined Lincoln Center to universal acclaim, and who have just been announced as the winning architects for the coming MoMA re-design. Friday morning was spent in our gorgeous, and I believe now-incomparable, Alice Tully Hall. I personally have not heard a chamber hall in the world, especially of that size (900-1000 seats) with such extraordinary acoustics. And what a pleasure to hear the amazing music of Benjamin Britten in it, with all its ingenious details and vibrant colors so clearly and compellingly heard. In between rehearsal and concert I spent some serious time at the Juilliard School, meeting with the administration and coaching some ensembles. Next year I will be able to gradually increase my teaching availability, and I am already wondering how I can possibly take on the six chamber ensembles that have asked me to work with them during the fall semester. 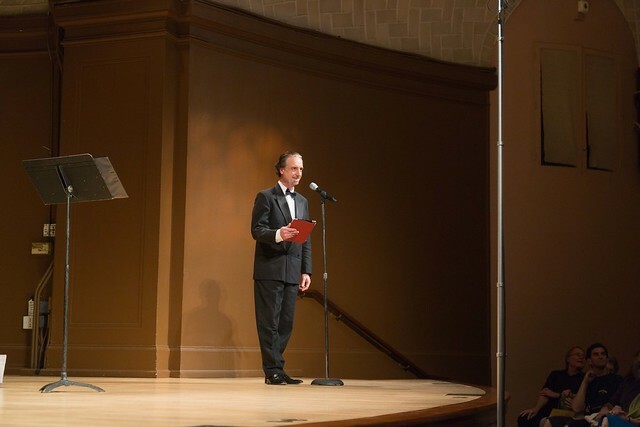 That evening we repeated the Chicago program, and once again, the large audience responded with the kind of excitement that presenters dream of – especially for programs of 20th century music. Our capping of the program with the Sonata was a personal highlight of our year, and a great way for us to finish our performances for the CMS 2012-13 season. Although I am usually not one to talk about reviews, I cannot help but mention the three raves this program received in Chicago, and the rare stamp of complete approval from the New York Times. 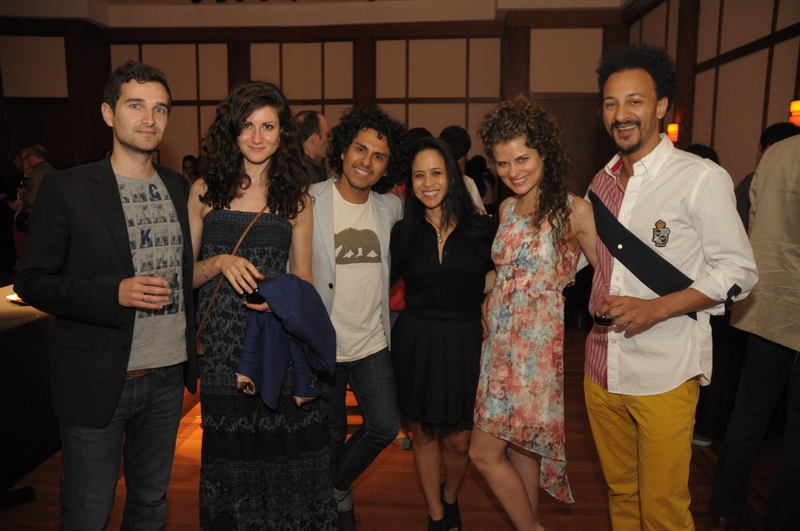 After the concert, there was a party for members of CMS Now, a membership program for young professionals created by CMS Director of Marketing Lauren Bailey. Approximately 100 young listeners jammed the Rose Studio to spend some relaxed, quality time together, imbibing wonderful wines and spirits provided by Warwick Vineyards and event sponsor The L Magazine. After a short night, we were up early to pack for our upcoming trip to California, then Korea. I was at the Juilliard School at 8:30am to hear the dress rehearsal of my cello student, Sarina Zhang, in Paul Recital Hall. Sarina has graduated with distinction from Juilliard Pre-College and will continue her cello studies next year at the college with Richard Aaron and myself, and her piano studies with Yoheved Kaplinsky. After some brief work in the CMS office (which is a 60-second walk from the Juilliard School) I returned at 11 a.m. to Paul Hall to hear Sarina and her pianist Carlos Avila perform Beethoven’s Sonata in C major, and to hear Sarina play two fiendishly difficult unaccompanied pieces by Joel Friedman. Unfortunately I had to miss her Chopin Sonata with pianist Jun Cho because I had to catch the 12:05 p.m. train to Washington. 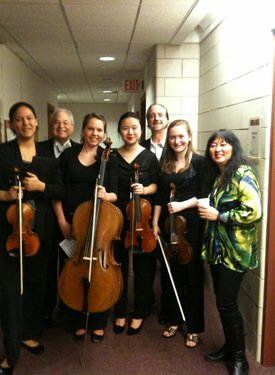 My last trip to Washington was the beginning of my historic end of days with the Emerson Quartet. Traveling with my family, I was filmed wistfully looking out the window, and working on the short speech that I would deliver at the concert. Upon arriving in Washington, Wu Han raced off to the WETA station for an interview, and I plunged into my last rehearsal, ever, with the Emerson String Quartet. It was a bit strange, I’ll admit, and at the conclusion of it, we all went our separate ways, perhaps somewhat wary of confronting the reality of the moment. We have enjoyed an annual series at the Smithsonian for thirty-five years, which began one year before I joined the quartet. There could not have been a more fitting place for me to say goodbye to the quartet. The backstage scene at the Natural History Museum’s Baird Auditorium was very different than usual. American Public Media came all the way from Minnesota to record the concert, bringing with them their star announcer, our long-time friend Fred Child. I have done more interviews with Fred than I can remember, but they have always been memorable, enjoyable and intelligently conceived. It is a privilege to be welcomed to the airwaves, and now the internet, by such a virtuoso media personality. 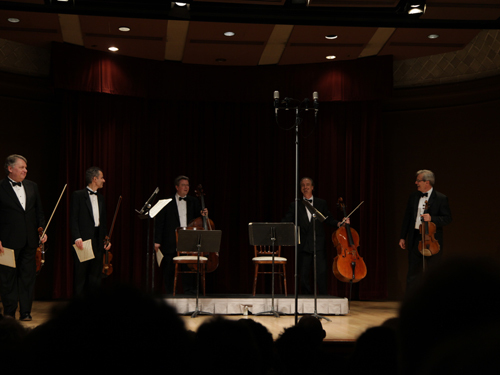 After a brief introduction by incoming Smithsonian Resident Associates Director Frederica Adelman, and Fred Child, the Emerson took the stage for a somewhat nerve-wracking performance of Haydn’s Quartet Op. 20 No. 4. I’m not sure if my colleagues felt the same way, but I was mostly concerned with not making a mess of my last Haydn Quartet, and thoughts of the significance of the moment and the sentimentality potentially attached to it, found little room in my brain. The Haydn began and ended without significant incident that I can remember, and we plunged into the frenetic and breathless Bartok 3rd quartet, which, I daresay, went as well or better than it ever has, at a fever pitch, and all the more so because we didn’t have the chance to rehearse a note of it. It continues to mystify me how this works, but quite often in classical music, rehearsals often complicate matters, especially when an ensemble already knows a piece quite well. I think we were all rather amazed. During the intermission I spoke with Fred Child, who asked the inevitable “How are you feeling right about now?” question, and I responded the best I could. 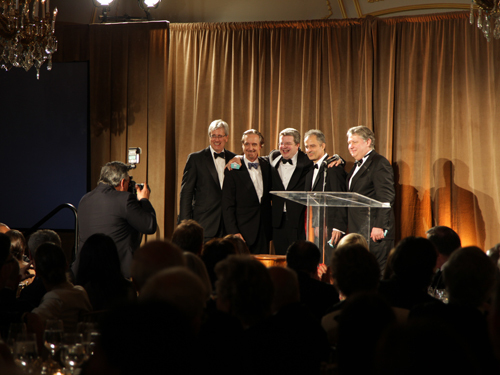 Thanks to Smithsonian Institution – for providing us a home in which we grew, a unique place where we have played more concerts than any other, and likely performed every quartet that we have ever learned. And thanks to you, our audience tonight, composed of many who have come a great distance to be with us, and those of you who have been with us for many concerts, like Carl Girshman, Carl, where are you and what number Emerson concert is this for you? 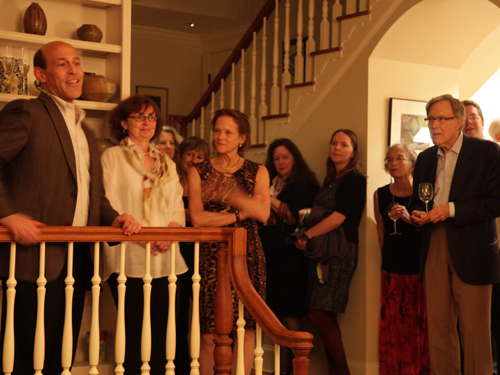 to Paul Watkins, my brilliant successor, for making that exciting future possible. Please enjoy the concert, and thank you very much. The performance of the Schubert was everything I had hoped for. Paul played magnificently; his energy, excitement and artistry permeated the ensemble and the entire room. The Smithsonian public welcomed him with open arms, and the warmth of the event allowed me to leave the hall with a sense that all I had helped to build there will continue with strength and conviction. But the night was not over. 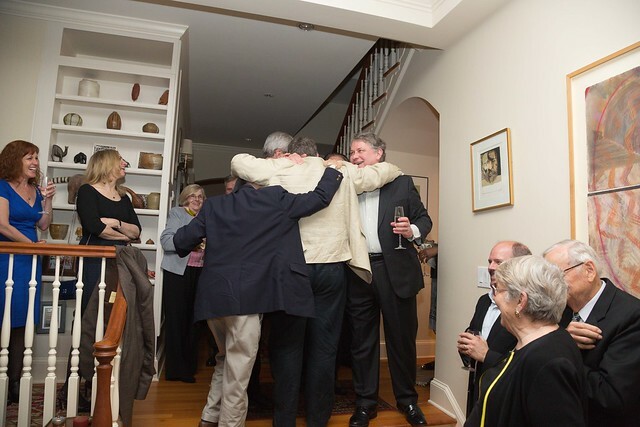 Running to our various cars in a drenching rain, the Emerson Quartet and its families headed to Chevy Chase where an intimate party was given at the home of close friends Rob Josephs and Gerri Carr, co-hosted by Kathe and Edwin Williamson. Way too late, the members of the Emerson Quartet, new and old, headed off into their new lives. 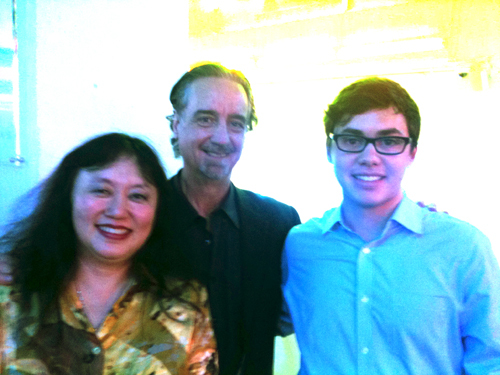 For me, Phil and Wu Han, it was another early flight the next morning, to California, where we concluded Music@Menlo’s Winter Series with a trio concert. And the next day, it was off to Korea on a long flight, which thankfully has given me the time to complete this very long blog about this week – one certainly like no other. In the space of a few hours, history was made at The Chamber Music Society, as David and Wu Han signed a new contract to continue to lead the organization through the 2018-19 season. This, their third contract, makes them the longest-tenured Artistic Directors since the Society’s founder Charles Wadsworth retired in 1989. 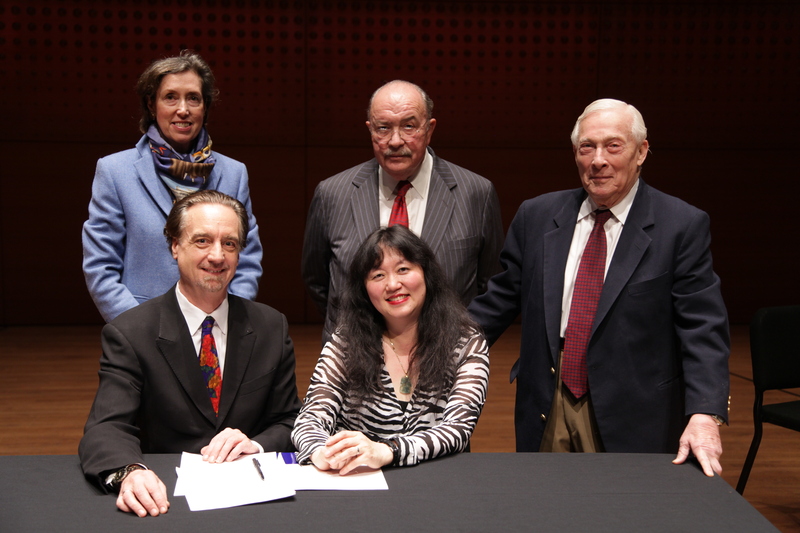 The signing, on the stage of Alice Tully Hall, was presided over by Board Chairman Peter Frelinghuysen, with incoming Executive Director Suzanne Davidson and David and Wu Han’s attorney Stanley Plesent looking on. A link to the press release can be found here. 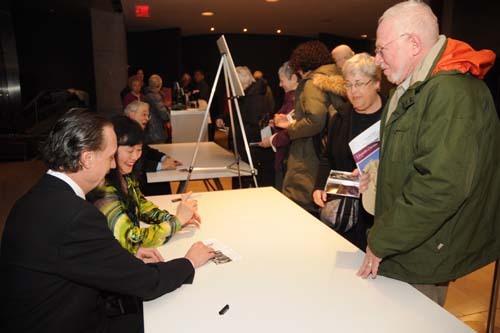 Immediately following the signing, David went backstage to prepare for another “first” in CMS history: the first concert by the Cellists of Lincoln Center, a collection of cellists from the Lincoln Center campus performing music for solo cello, and cello ensembles of up to eight players. 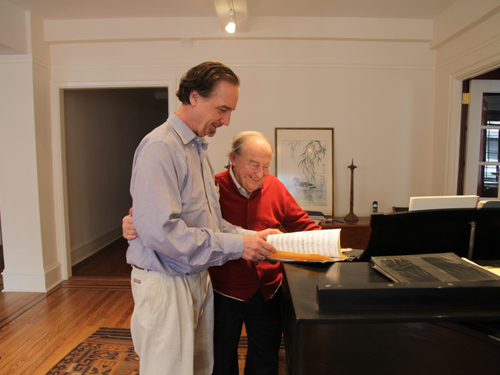 As the brainchild of Metropolitan Opera Orchestra principal Jerry Grossman, the program was several years in the making. 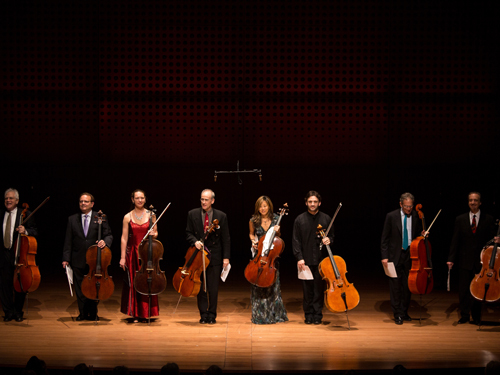 Although a major departure from the standard chamber music repertory, this was one of the season’s most popular offerings, including a wide variety of works by Villa-Lobos, Gabrieli, Dutilleux, Tansman, Schickele, Stravinsky, Carter, Casals, Pärt and Bach, the Cellists of Lincoln Center brought the house down and left everyone hoping they will someday play again. After two years of intensive planning, the St. Cecilia Music Center of Grand Rapids, Michigan, and the Chamber Music Society of Lincoln Center launched a three-year partnership with a concert by Wu Han, Philip Setzer, and David Finckel. The performance took place before a wildly enthusiastic crowd in the stunning hall at the Music Center. One of America’s great classical music stories began in the year 1883, when a group of women in Grand Rapids decided to begin a musical organization named the St. Cecilia Society, after the patron saint of music. The organization’s mission was to “promote the study and appreciation of music in all its branches” and that vision is still at work today. Initially performing for each other in their homes, the women eventually raised the funds to build the magnificent building which is now St. Cecilia’s own, and they began importing internationally renowned musicians to perform. Today, St. Cecilia offers music education and activities for musicians of all ages and abilities, as well as performances by distinguished artists. The idea of a relationship with St. Cecilia entered my thinking when I first played there about ten years ago with the Emerson Quartet. 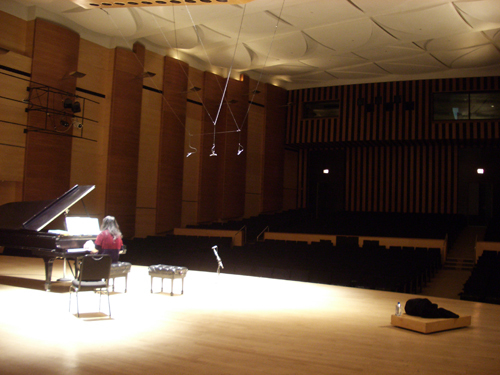 Returning with a duo recital a couple of seasons later added fuel to the idea, especially when Wu Han laid eyes on the extraordinary hall, and after both of us had learned the Center’s inspiring history. Under the dynamic leadership of Executive Director Cathy Holbrook, the Center is thriving and expanding its vision, and CMS was there at the right moment to offer the center a seasonal selection of some of our most exciting programs from the New York stage. 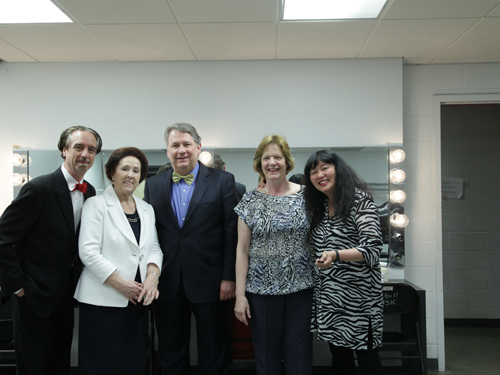 Left to Right: Cathy Holbrook, Executive Director; David Finckel and Wu Han, Artistic Directors; Chuck and Stella Royce, the namesake of the Royce Auditorium at St. Cecilia Music Center. 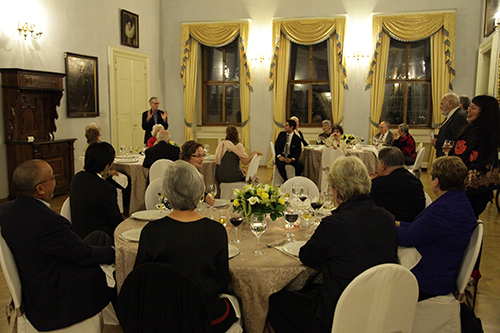 A lively donor reception and dinner the evening before our concert allowed us to thank and acknowledge the contributions of all, to explain the project, and to get to know the Center’s most important supporters. As is so often the fact, this group of patrons comprises a collection of smart, passionate and dedicated people who are determined to ensure that the institution is secure and will allow our partnership to thrive. We were very impressed with all of them and look forward to building these new friendships over the residency’s three-year period. As Philip, Wu Han and I are playing our Dvorak Trio program in Alice Tully Hall in January (as well as a substantial number of other places this season) we decided to kick the series off with this romantic program, which includes the last two great trios of Dvorak, the f minor and the “Dumky”. 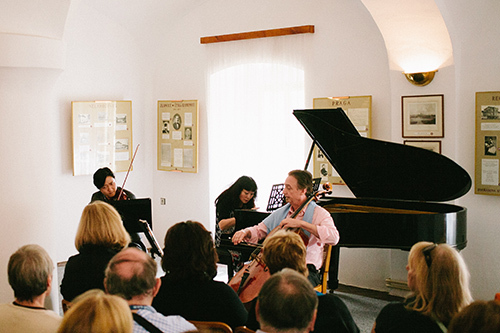 As an opener, Wu Han and I offered Brahms’ first sonata in e minor, which connects the many dots between Brahms and Dvorak that resulted in a great friendship and whole-hearted support of the young Czech composer by the Viennese master. The explosive vocal greeting we received entering the stage after Cathy spoke (we can’t imagine what she must have said!) led the way to a thoroughly satisfying experience on the stage of this fantastic hall. 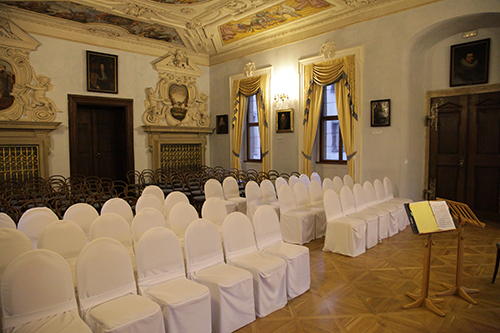 Seating about 500, it is the perfect size and acoustic for chamber music, and we know that all our musicians from CMS will come home with rave reviews about the concert hall, the public, and the organization and its people. We look forward to the next opportunity we will have to play there –I hope it’s soon– but I am equally excited to be sending so many stellar players from the CMS roster to share in this joyful and exciting project. Departing Venice bathed in the warm evening light, the Corinthian II – the 114-passenger ship that has hosted both prior CMS cruises – set sail for a ten-day itinerary of stops at historic sites, gourmet meals on board and off, and four concerts by CMS musicians David Finckel and Wu Han, violinist Alexander Sitkovetsky, and violist Paul Neubauer. After such a quick exit from the wonderful world of Music@Menlo, and a hurried stop in New York for an Emerson Quartet concert at the Mostly Mozart Festival (my last Mostly Mozart performance with the quartet), it was a relief to finally board a flight on Tuesday afternoon. 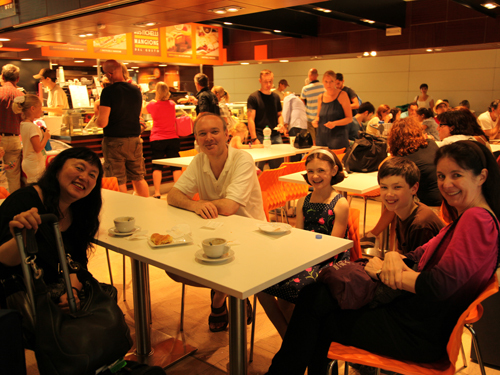 We eventually arrived in Venice’s Marco Polo Airport, where, in my quest for the first cappuccino of the tour, I met up violist Paul Neubauer and his family: his wife, violinist Kerry McDermott, and their extraordinary children Clara and Oliver, all of whom accompanied us on the cruise. 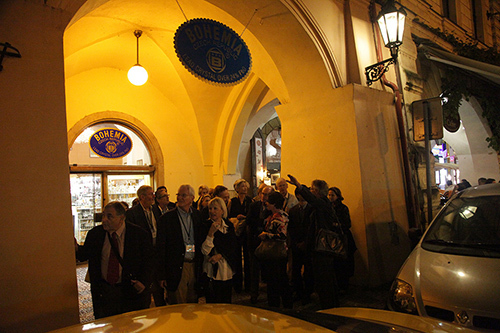 A meeting at Venice’s centrally located Monaco Hotel, located on the Grand Canal, passengers were given a chance to greet each other for the first time. 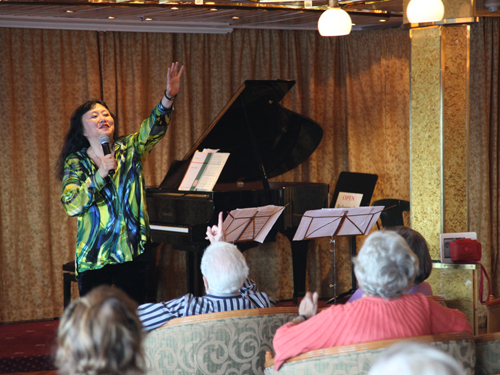 It was in the hotel’s elegant upstairs ballroom that we first encountered violinist Alexander (“Sasha”) Sitkovetsky, and his talented and charming wife, pianist Qian Wu, who would also accompany us on the voyage. 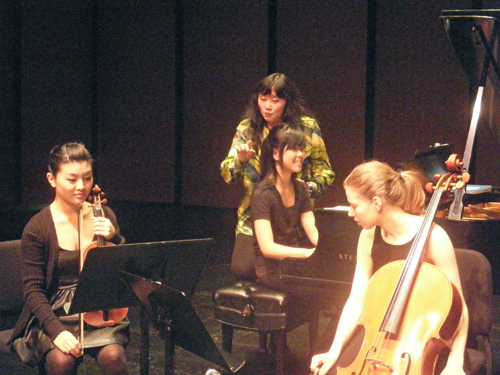 (Qian and Sasha, much like me and Wu Han, are a professional duo, and have started a very successful piano trio!). After a quick lunch in Venice, we all headed towards the nearby parked ship, and on the Corinthian II’s stern, everyone relaxed, said hello, and readied for the sail out of Venice onto the Adriatic. We said hello to our many friends, including Edwin Williamson and his wife Kathe, who is a recent and welcome addition to the CMS board. We also had the pleasure of introducing Music@Menlo long-time volunteer Alice Wong to our many CMS friends and fellow musicians. Waking up to a new harbor is one of the most magical, recurring events on these cruises. The picturesque harbor of Ortona, a small town halfway down the Italian peninsula, on the Adriatic side, was our first stop. 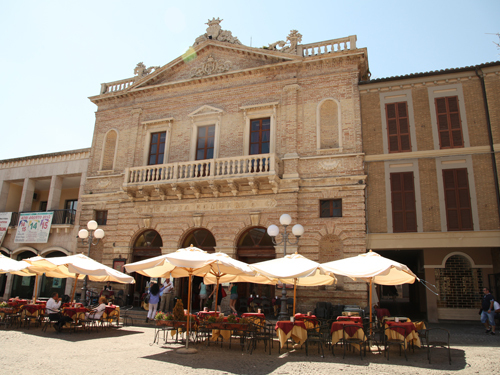 Ortona was our point of departure for the small village of Atri, the location of our first concert, which took place in the exquisite Teatro Communale. 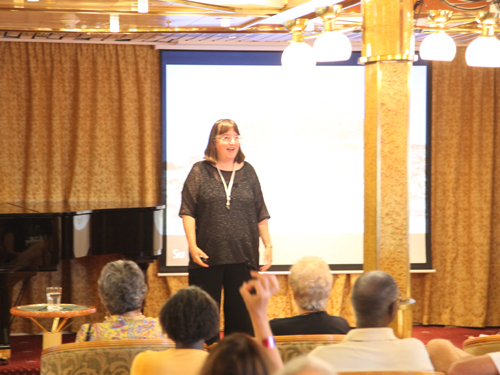 The program, performed exclusively for our voyage companions, consisted of a Mozart Duo for violin and viola, and the Mozart Piano Quartet in Eb. 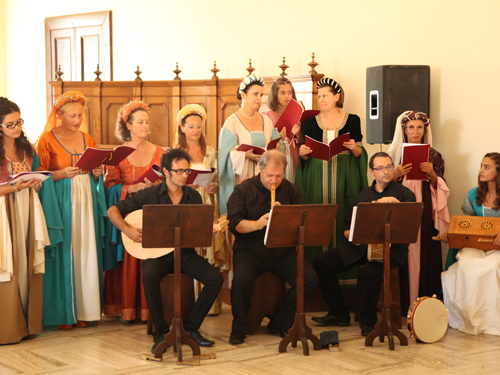 After the concert we walked to the nearby Palazzo Ducale for a buffet lunch, complete with entertainment by a costumed renaissance band. 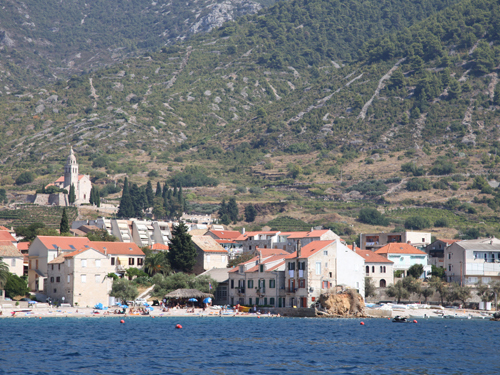 Another morning brought another magical arrival, as we docked just off the shore of the tiny Croatian island of Vis. The island is quite unspoiled due to the fact that it was a military base for the former army of Yugoslavia, Marshal Tito’s hide out, and was not opened for tourism until 1989. It is the farthest from the coast of all the Croatian islands. A standout of the vista is the hillside Church of Our Lady of the Pirates. Heavy repertoire loads for the cruise and our coming residency at the Mecklenburg Festival prevented me, and Wu Han, from joining many sight-seeing tours on this cruise, which unfortunately included the excursion on the island of Vis, although I did take the jetty to shore town of Komiža to briefly to grab some wifi, and the chance to post my most recent blogs. 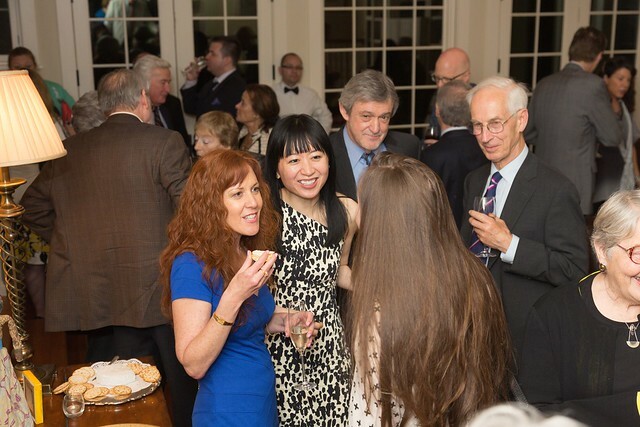 The evening brought the Captain’s welcome dinner, for which everyone dressed up, including Sasha and Qian, and CMS board member Harry Kamen and his wife Barbara. Howdy and Mary Phipps on the main deck. 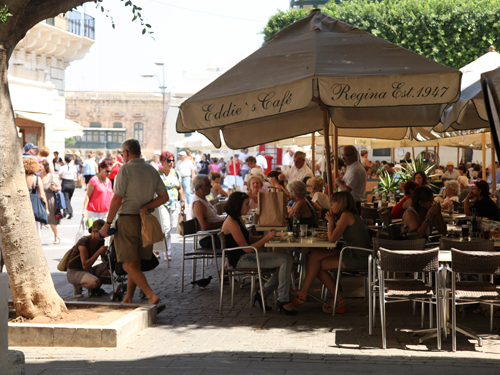 Monopoli is an Italian town that sits further down the coast towards the heel of the boot of Italy. It is in the region of Bari, and close to a city we visited last year, the town of Taranto, from which we visited nearby Greek ruins. 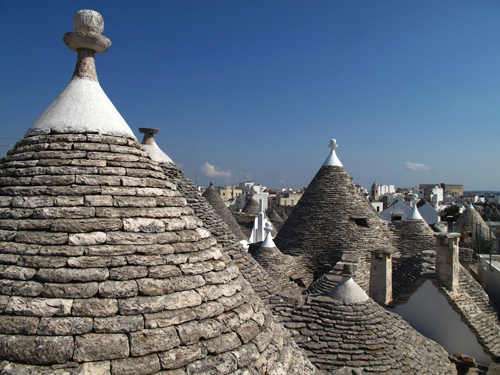 Once again, I missed the sight-seeing activities, but Wu Han did get out to the town of Alberobello, a UNESCO World Heritage Site, famous for its beehive-shaped houses that could be dismantled in moments to evade heavy taxation. 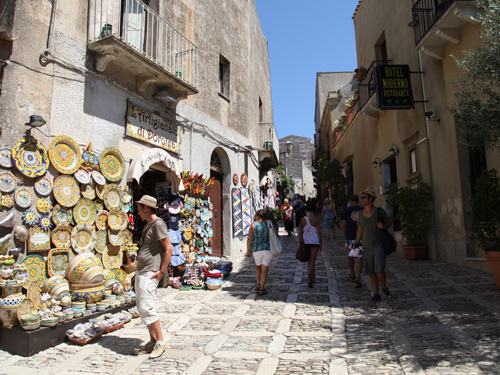 Wu Han, however, had to forego the afternoon trip to the popular tourist destination of Ostuni, famous for its churches, monuments, and ancient history. 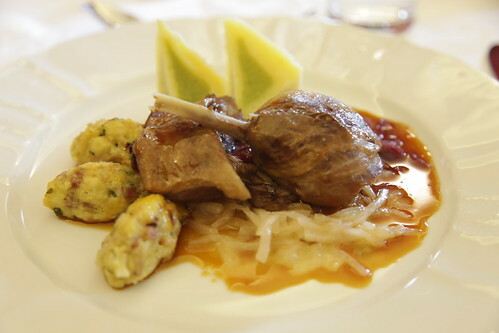 There was way too much repertoire on our plates to be able to enjoy the same opportunities as our fellow passengers. The next morning we awoke in the port city of Crotone, the southern Italian city on the Ionian sea where the Greek mathematician founded his school in 530 B.C. Foregoing the local sights, the musicians set out by special bus for the spectacular hill town of Santa Severine, the location of our second concert. Known as the “Stone Ship”, the town sits atop a stone outcropping and overlooks the beautiful surrounding countryside. 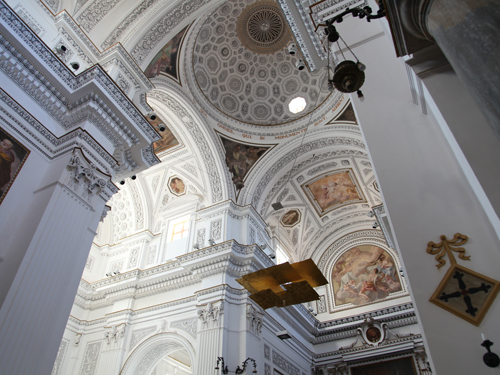 The concert took place in the Baptistery of Santa Anastasia Cathedral, another truly unforgettable setting. 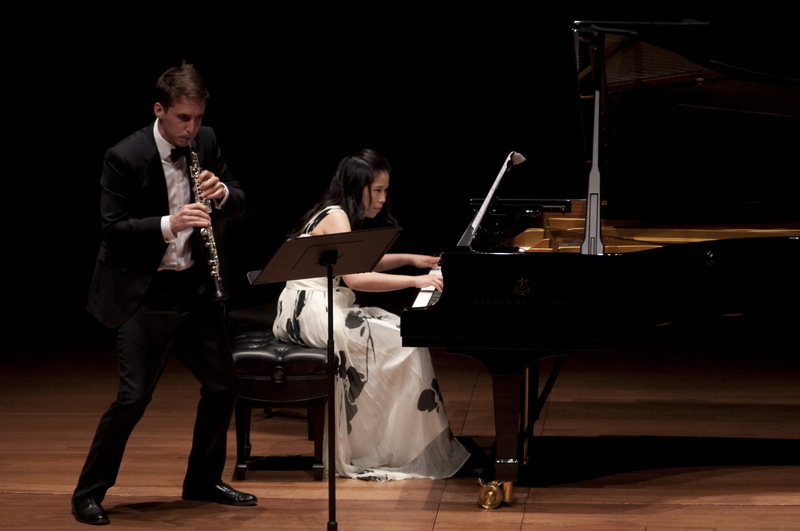 Wu Han and I performed Bruce Adolphe’s atmospheric and engaging “Couple”, the first work ever commissioned for us. Dohnanyi’s Serenade for violin, viola and cello demands a high level of instrumental technique and extreme concentration from each player. It was a special pleasure to rehearse and perform this piece with Paul Neubauer, who has undoubtedly played it hundreds of times, and with Sasha, who contributed extraordinary energy and flair. 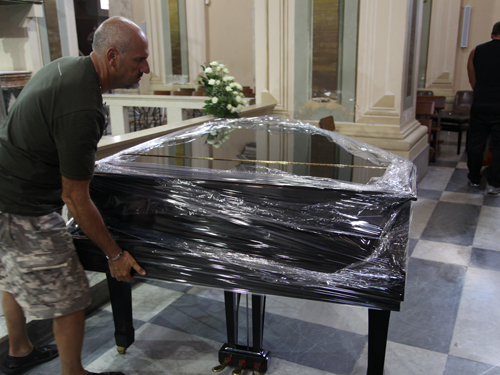 After the concert, the piano was wrapped in plastic and taken away. 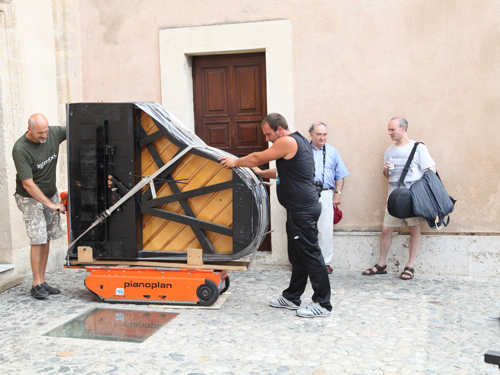 All the pianos we experienced on land where shipped in for our performances, and all miraculously showed up, complete with technicians. 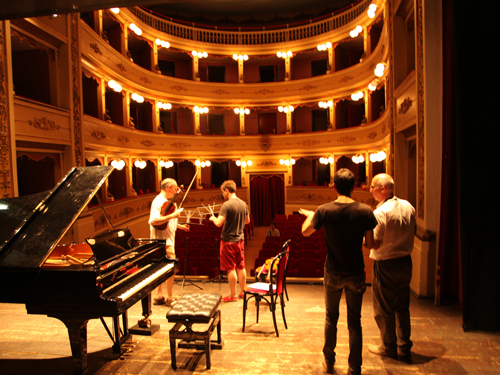 Later that day, we rehearsed for our next performance in the ship’s concert space/lecture hall/meeting room. Straight-backed chairs were not always easy to locate but CMS musicians are famous for their adaptability. 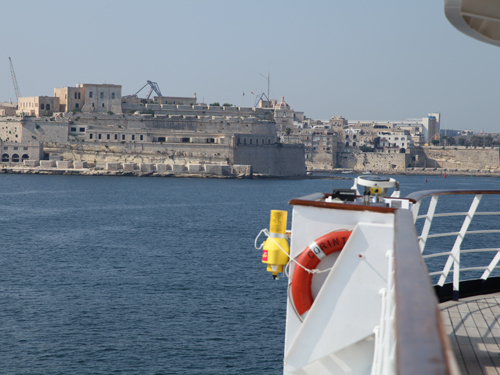 After a long overnight sail, we pulled into the famous harbor of Valletta, on the island of Malta, situated halfway between Sicily and Africa in the Mediterranean Sea. It was our southernmost stop, and by far, the hottest. It is indicated on our cruise map by the green arrow at the bottom. 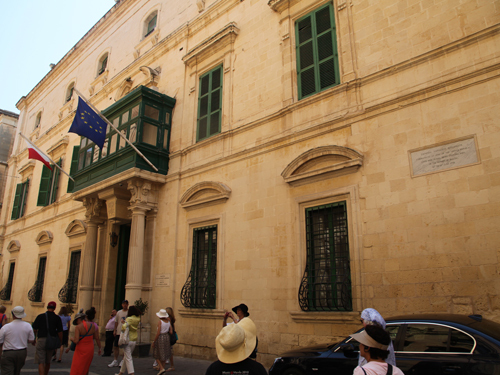 Napoleon Bonaparte played a part in Maltese history when he took the island in June of 1798, living in this house during his occupation of the city. 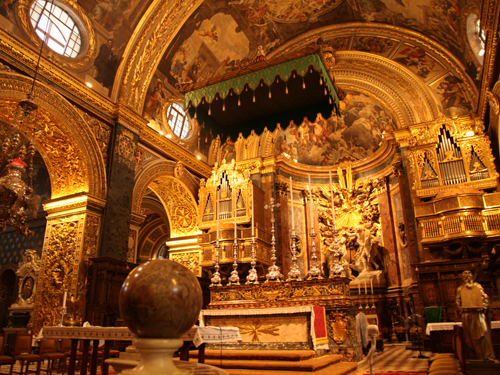 But by far the most incredible sight in the city is the Cathedral, built by the Knights of Malta in the 16th century. 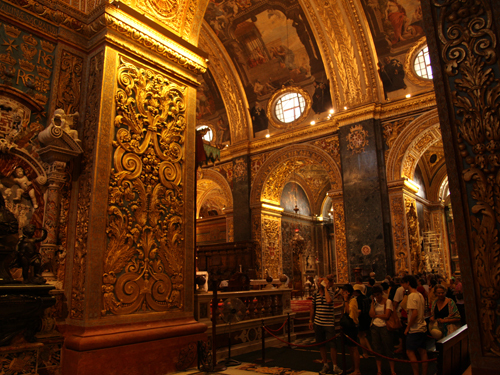 It is one of the most lavishly decorated churches in the world, and is constantly packed with visitors. 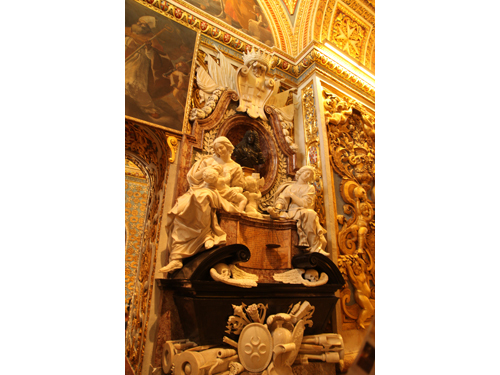 The church is packed with sculptures and treasured paintings, among them, the famous Beheading of St. John the Baptist by Caravaggio. 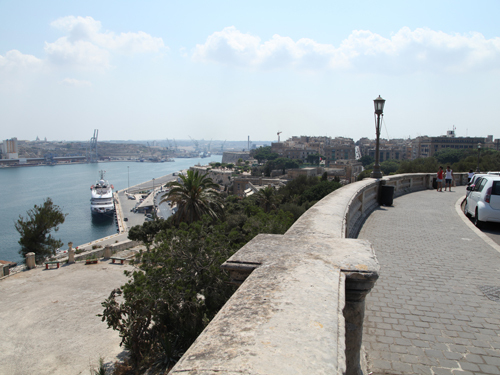 It was an easy, but sweltering, walk from the center of Valletta back to the Corinthian II, harbored so conveniently below. 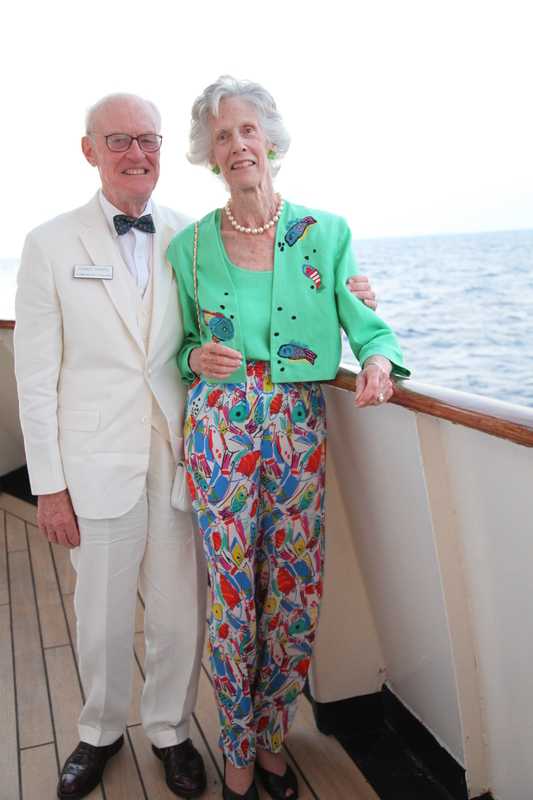 The departure from Valletta included a rehearsal aboard ship, followed by champagne on the rear deck with Kathe and Edwin Williamson. 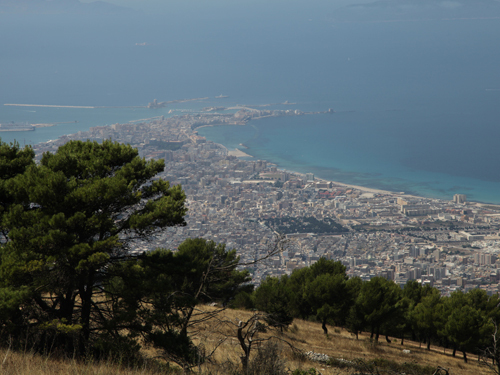 Our next stop was the Sicilian port of Trapani, which sits on Sicily’s western coast. 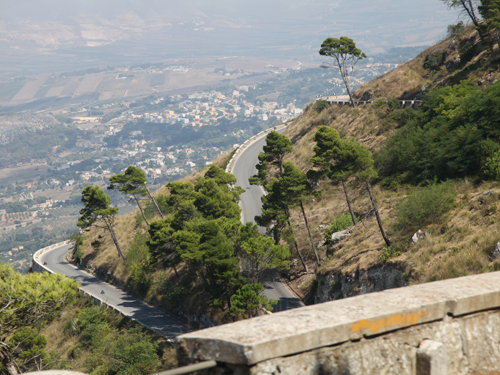 Trapani, founded to serve as the port city for the medieval hill town of Erice, was our point of departure for the visit to the historic town; our third concert location. Buses awaited us a ship side to take us comfortably on the tour, although, in this case, the ride up the hill was a little more than many of us had bargained for. 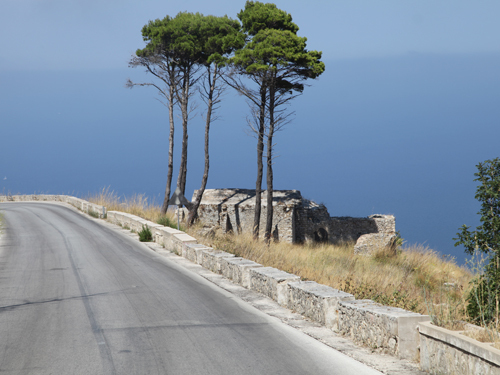 Erice is situated at an altitude of 750 meters, overlooking Trapani. It is quaint beyond words, a labyrinth of small streets with few cars, and stunning vistas everywhere. 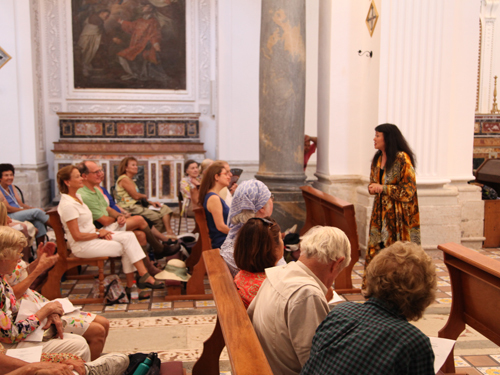 Our concert was in the Chiese di San Martino of Erice. The concert included a fantastic performance of Bohuslav Martinu’s Madrigals for violin and viola. 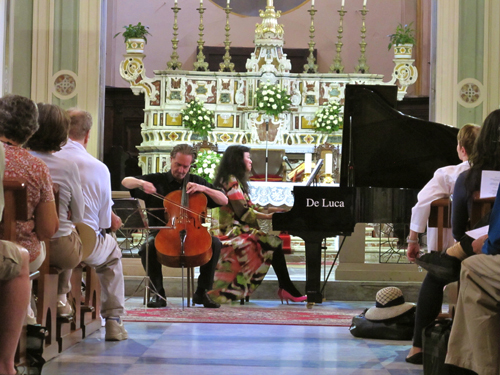 It is purely a coincidence that we performed Martinu in the church of Saint Martin, and also, that one of the church’s resident saints also appeared to take part in the performance. 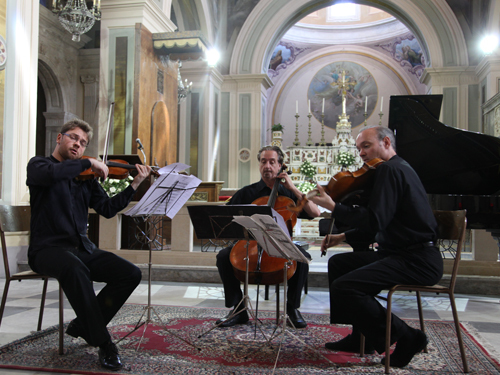 The program also included Beethoven’s Piano Trio, Op. 1, No. 1. 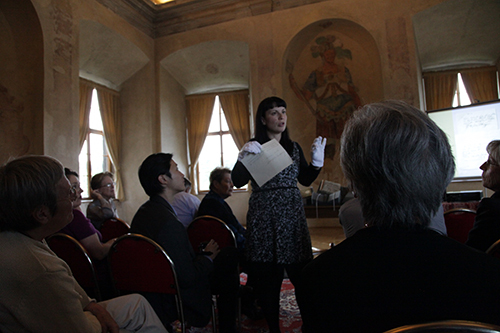 Wu Han, always in full concert attire, introduced the work to our captive but eager audience. 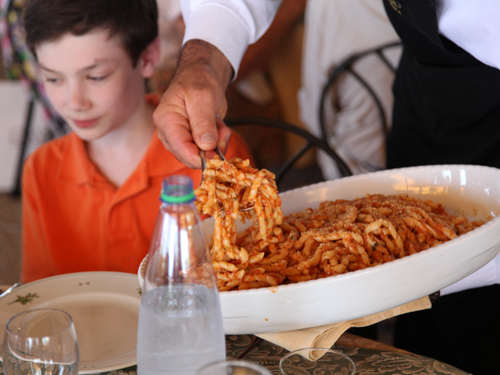 Lunch was a short bus ride away, still on the hilltop, in a hotel whose dining room and swimming pool overlooked Trapani. 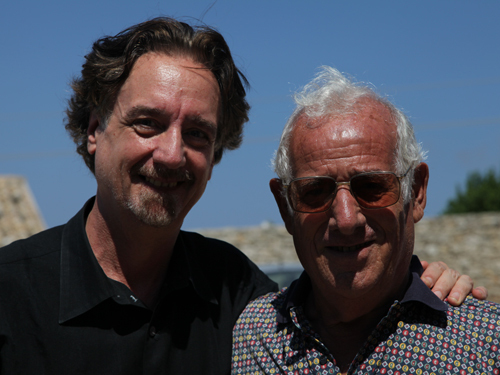 It was after lunch that we said goodbye to Travel Dynamic’s Italian tour manager, a gentleman passionate about music who followed us to all our Italian locations and enjoyed our concerts immensely. The descent was a little less harrowing than the climb up, and afforded us spectacular views of the ocean and surrounding mountains. 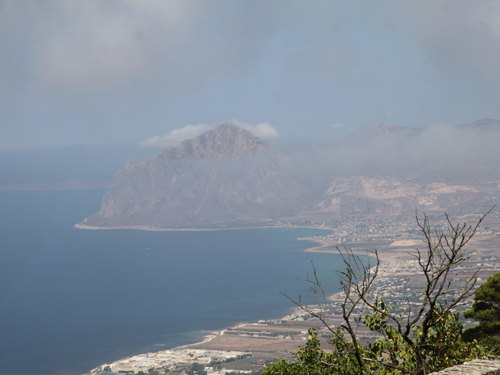 During our evening departure (and after I had a great swim in the sea) we could easily see Erice situated high over the port of Trapani. 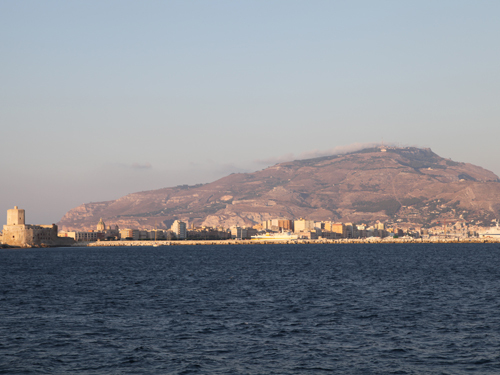 A long sail finally put us into the harbor of Cagliari, on the southern tip of Sardinia, the second largest island in the Mediterranean Sea (after Sicily). 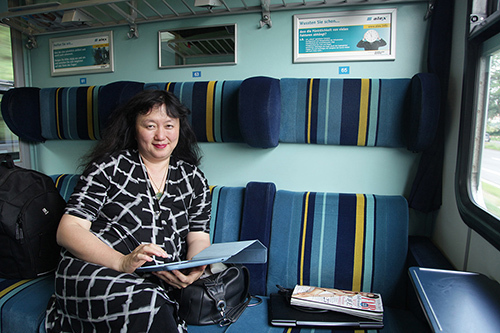 Once again, musical obligations prevented me and Wu Han from visiting the historic sites of Barumini and Nora, but we heard much about them from our fellow passengers upon their return. 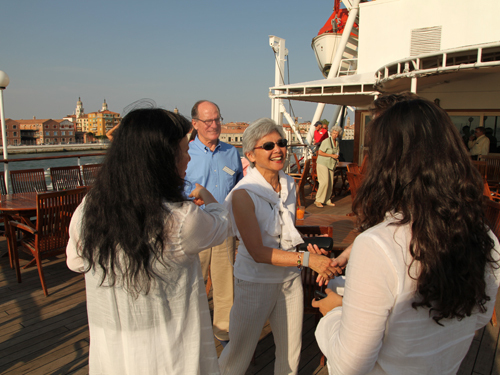 I had visited Cagliari once with the Emerson, and although I remembered it fondly, was not able to make it off the ship to relive the experience or show the fantastic city to Wu Han. Next time, hopefully. The following day was spent on the open sea, a fantastic experience, especially when the sea is the Mediterranean and the weather is sunny and the winds are calm. 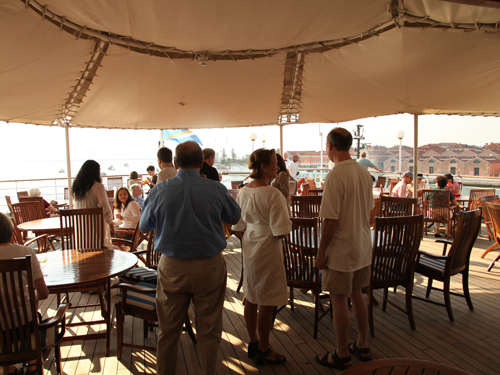 We spent most of the day practicing and rehearsing, and getting ready for our final concert that evening on board ship. 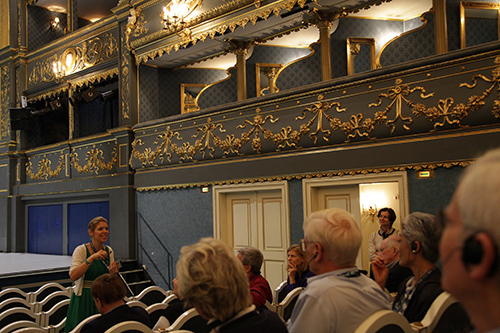 Guest Lecturer Anne-Marie Bouché delivered her final presentation “Past meets Present: The Recovery, Interpretation and Preservation of Archaeological Remains” in the lounge, after our rehearsal. 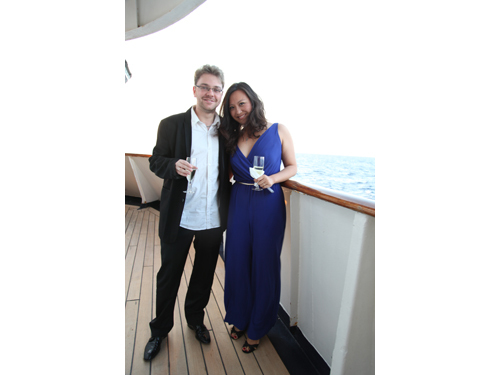 A highlight of the cruise for many, I’m sure, was the added performance by Oliver and Clara Neubauer as a Prelude Performance to ours. It consisted of violin duos expertly played and professionally presented, including verbal introductions to each work performed. Wu Han welcomed them to the stage. Clara and Oliver, 10 and 12 years old respectively, had spent the three weeks prior to the cruise at Music@Menlo as Young Performers, and seemed to truly thrive. They brought all the dedication to their performance as could be expected of truly dedicated performers, and the packed house demanded an encore. It was one of the most unforgettable moments of our journey. Even the Captain showed up to listen. There was much joy aboard the Corinthian II after this concert. The senior musicians finished up our concert series with two works: the Seven Popular Songs of Da Falla, arranged for violin and piano, and the enormous Piano Quartet in c minor by Gabriel Faure. 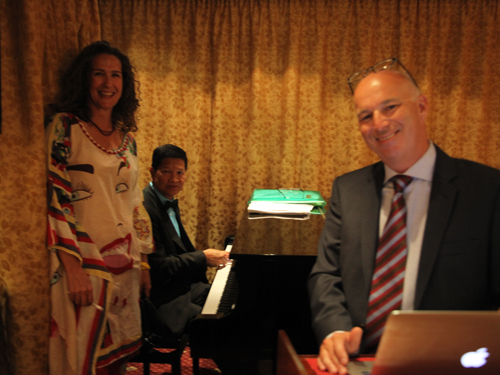 But perhaps stealing the show was Paul Neubauer’s performance of a set of Gypsy-inspired works, accompanied by me, Wu Han and Sasha. Long a specialty of Paul, who has studied Gypsy music and even sat in with authentic Gypsy bands, these performances included not only stellar playing but interactive elements which are best described by the following photos. 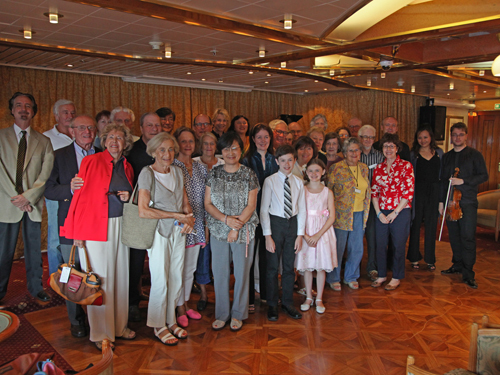 Following the concert, the group who had joined the cruise through the Chamber Music Society gathered for a group photo. 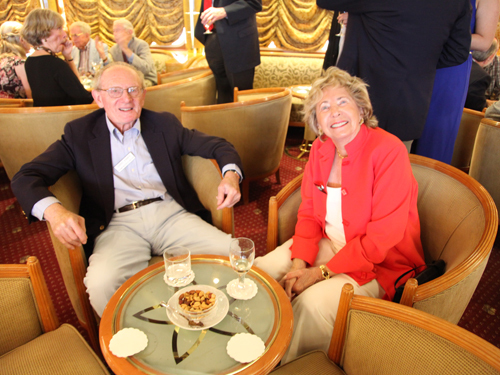 The Captain’s final reception and dinner provided everyone a chance to reminisce, exchange contact information, pose for photos, and to watch a beautiful slide show prepared by the tour staff. For the final dinner, the kitchen pulled out all the stops, offering lobster tails and Baked Alaska. 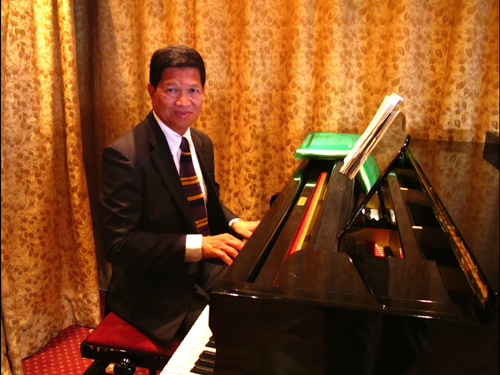 The musicians gathered to thank the ship’s pianist Eddie, whose beautiful playing graced the bar nightly. There was no time to see anything of beautiful Barcelona as we hurriedly departed the ship at 8:30am for our flight. Some lucky ones stayed on to see the city, even spending several days. But for Wu Han and me, other obligations called, and we were soon aboard the first of three flights that day that would take us to see and perform in a place we had never been. Stay tuned. 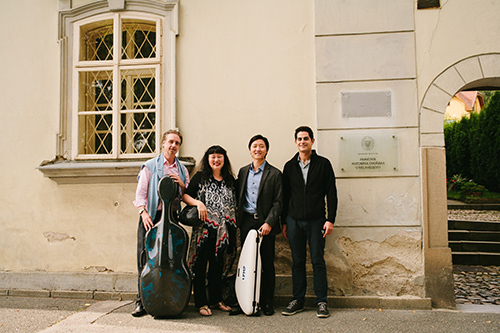 On Wednesday, January 25th, David Finckel, Wu Han, and David Shifrin journeyed, respectively, from Frankfurt, San Francisco and Nashville to Chicago, where they met to perform the inaugural concert of CMS’s three-year residency at the Joan W. and Irving B. Harris Theater for Music and Dance. Three days of radio interviews, master classes and the performance provided the annual three-concert series with a solid beginning. The name of Harris holds a special place in our hearts and memories. First, our ongoing close friendship with Joan Harris is based on a shared commitment quality, service to arts and community. She has long set an example for us as a model citizen, fueled by a sense that her work is never done. What she and her family have given to their communities is inestimable, and we are privileged to have been a small part of it. It was in Aspen that we first met, and our lives truly converged as Harris Hall, the festival’s indoor, all-season venue, was nearing its completion in the summer of 1993. 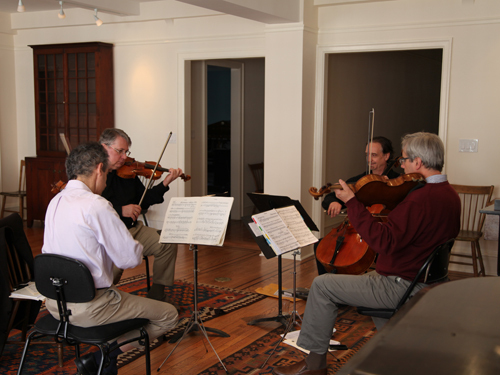 The Emerson Quartet, in residence at the festival, was called in to test the hall’s acoustics for the project’s principals, including the architect, acoustician, festival administrators, and Joan and Irving Harris. It was a truly memorable sight, the quartet sitting on stage in white jackets (we had just come off the Tent stage next door) and surrounded by cement mixers. But the sound of the Adagio from Mozart’s K. 575 soon eased any doubt that this hall was about to emerge as one of the most significant built in America in the 20th century. The hall’s natural sound, and dead quiet (it is buried underground so as not to disrupt Aspen’s revered vistas) led us to the idea of recording the Beethoven sonatas there. An arrangement was arrived at quickly for the summer of 1997, when we not only recorded all the sonatas and variations but performed them as well. (The account of our recording late into the night and emerging in the Rocky Mountain moonlight can be found in the CD liner notes.) It was the first commercial recording made in hall, followed shortly by the Emerson’s Shostakovich cycle. Chicago has been the base of the Harris family for many years, and Joan and Irving were committed to the creation of a multi-purpose theater in their home town. 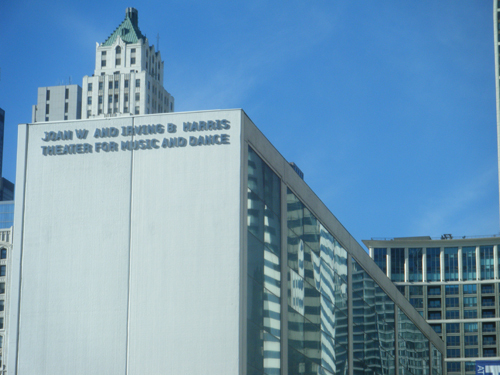 It was through their efforts, over many years, around many obstacles and despite failed attempts, that the Harris Theater for Music and Dance finally opened its doors on November 8th, 2003. 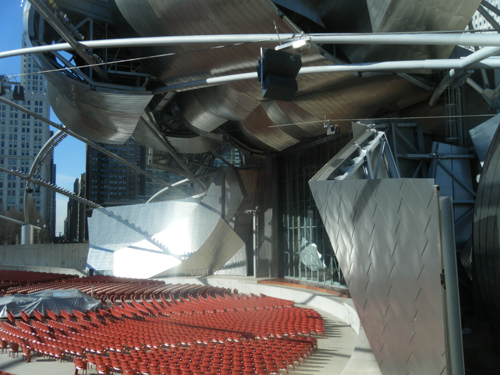 It is a large space (1200 seats) that, like its cousin in Aspen, resides underground on the north edge of Millennium Park, just behind the Gehry-designed Pritzker Pavilion. The theater’s mission is not only to present quality performances of music and dance, but to be a home and partner to Chicago’s numerous performing organizations. Beginning with twelve, the list of companies presented by the Harris has grown to thirty-nine, and CMS is now proud to be counted among the Harris Theater’s many vibrant relationships. For our inaugural concert, we decided that not only we had to perform but wanted to bring something especially powerful and representative of our work in New York. 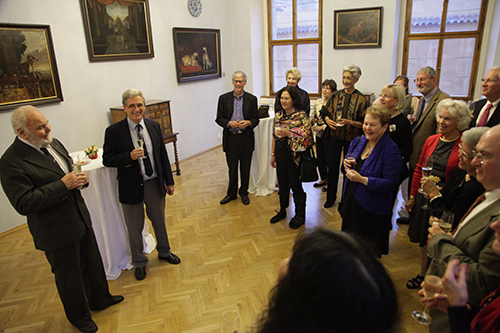 Nothing could have been more perfect for us to bring along our long-time colleague, and predecessor as CMS Artistic Director David Shifrin, to help us open the project on a high note. Our repertoire consisted of the Beethoven Trio, four pieces for clarinet trio by Max Bruch, and the great trio by Brahms. It is exactly the music on our CD recently released by ArtistLed, performed by us and David. 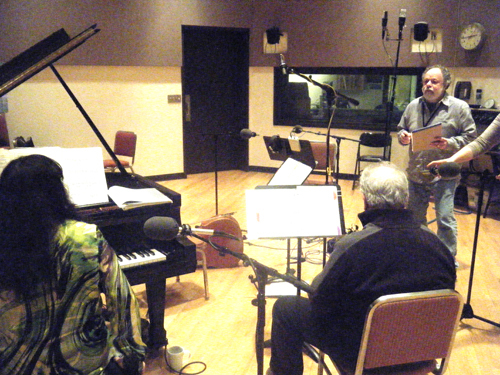 The days before the concert were filled with rehearsing and other activities, such as a visit to the distinguished WFMT studios for a live broadcast performance and interview with host Kerry Frumkin. Presiding over the event was producer Louise Frank, who is, coincidentally, the daughter of Joan Harris. The WFMT studio possesses some of the best acoustics we have ever encountered in a room that size, reminding us of CMS’s own Rose Studio. We felt immediately comfortable and the usually-nerve wracking sensation of live performance was thankfully absent. A free evening found our trio eating in a famous Chicago steak house, situated under the famous ‘L’ train line (the second oldest in America). 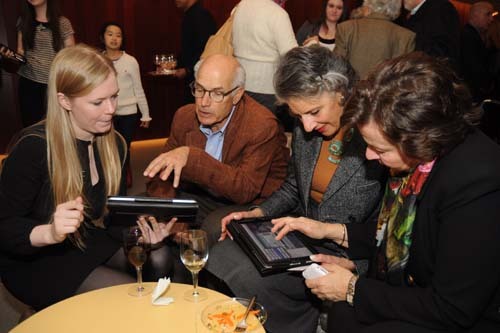 On the way into dinner, and at dinner, we enjoyed fantastic performances streamed live from CMS’s Rose Studio to our iPhones via the CMS iPhone app of the Late Night Rose concert, featuring the octets of Spohr and Enescu. Part of our residency also included teaching master classes, and giving a talk for the Music Institute of Chicago. One of the most important music education institutions in American, the Music Institute was founded in 1931. After working with extremely gifted students individually, we all met on the stage of Harris Theater to share some of our ideas about music study and performance, and to answer questions from eager students, parents and Institute administrators. For our concert the following evening we enjoyed the company of a large and friendly crowd of listeners who behaved as though they already knew us. It was the warmest welcome a musical trio of New Yorkers could ever imagine from in such an important American capital of culture. 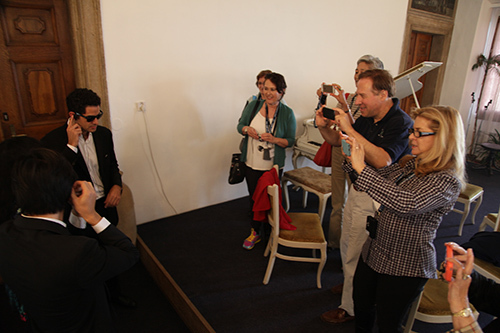 New CMS Two violinist Benjamin Beilman, enjoying a free night on tour, showed up to listen. And to cap off a great weekend, we were rewarded with a glowing review from the dean of Chicago Tribune critics, John von Rhein, who lauded not only our performance but the idea of the residency itself. Nothing could have made us happier. 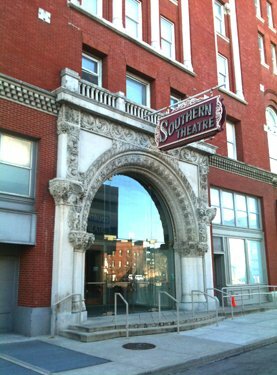 The day after our Chicago triumph saw us in Columbus Ohio’s Southern Theater for a repeat performance of the clarinet trios. 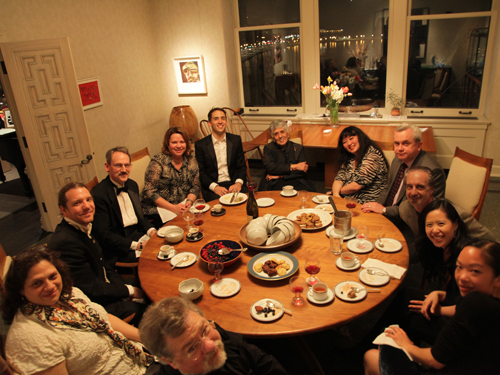 The presenting organization, Chamber Music Columbus, is one of America’s longest-running and most distinguished, running uninterrupted for sixty consecutive season, and supervised by a volunteer team of dedicated and intelligent chamber music aficionados. 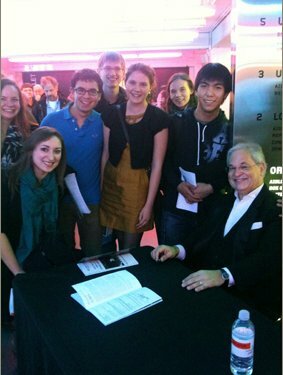 The large crowd included (as had the Harris Theater audience the previous night) a small herd of clarinet players who journeyed from far and wide to hear David Shifrin. While we have always admired David as the finest clarinetist we know, we only just learned on this tour of his apparent rock-star status among players of his instrument. Before the concert, a student string ensemble entertained the audience as a concert prelude. These dedicated and gifted students thrive under the guidance of Deborah Price, the director of The Chamber Music Connection, a stunningly popular, well-organized and unique (to our knowledge) organization that provides chamber music opportunities to a vast number of students. Check out their organization at www.cmconnection.org and maybe send them a contribution. They are worth it! 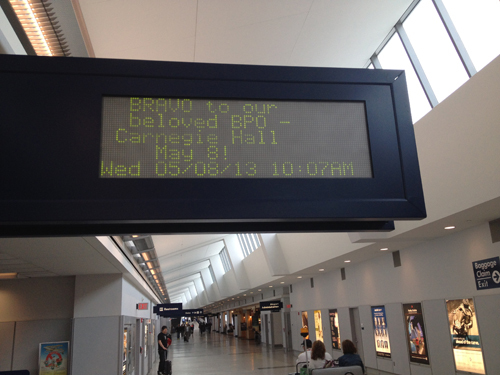 Returning to New York on an early flight Sunday morning, we rested and geared up for our first of two Tully Hall performances of the trios, plus the 2012-13 season announcement following the concert. It was truly a joy to walk on stage that day with David, someone who has given so much to CMS, and to make music for the audience that we have developed together. The affection he generates among the CMS crowd is palpable, and we were rewarded with the warmest of responses. Following a hectic CD-signing in the Tully lobby, we were ushered upstairs to the glamorous new Hauser Pavilion where a large crowd of donors, press and CMS board and administrators awaited the unveiling of the coming season. In the past, we have described the season’s events, accompanied by music and a power point presentation, to a crowd of about 100 in the Rose Studio. This year, however, our endlessly-creative marketing team, led by Lauren Bailey, constructed a web-based Season Preview that is miles beyond anything we have done before. Check it out at www.chambermusicsociety.org/12-13preview/ where one can find in-depth information about all the programs, including extensive interviews with the artists who are performing them. During the Season Preview, members of the CMS Student Producers gave quick tutorials to patrons on how apps works. What is astounding to reveal about the new incarnation of the Season Preview are the statistics. 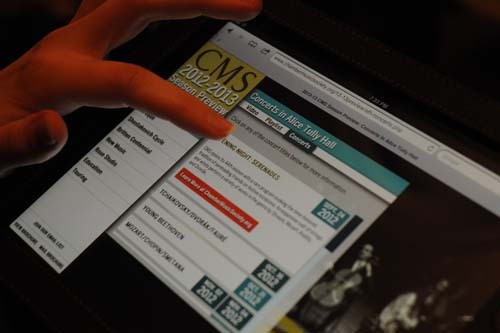 Since CMS began its extensive online activities two years ago, including the live stream Late Night Rose concerts, we have collected over 100,000 dedicated visitors each year. 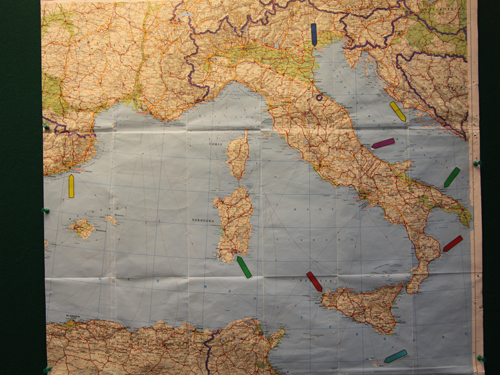 Listeners are experiencing the Chamber Music Society now in Spain, Canada, the United Kingdom, South Korea, Germany, France, Brazil, Japan, and Italy. We could not be more delighted to be sharing all the amazing work that CMS does for chamber music with a truly global audience, for the first time.